Thanks for the suggestions Todd I'll have to do that. Do you have the part that broke off by chance? 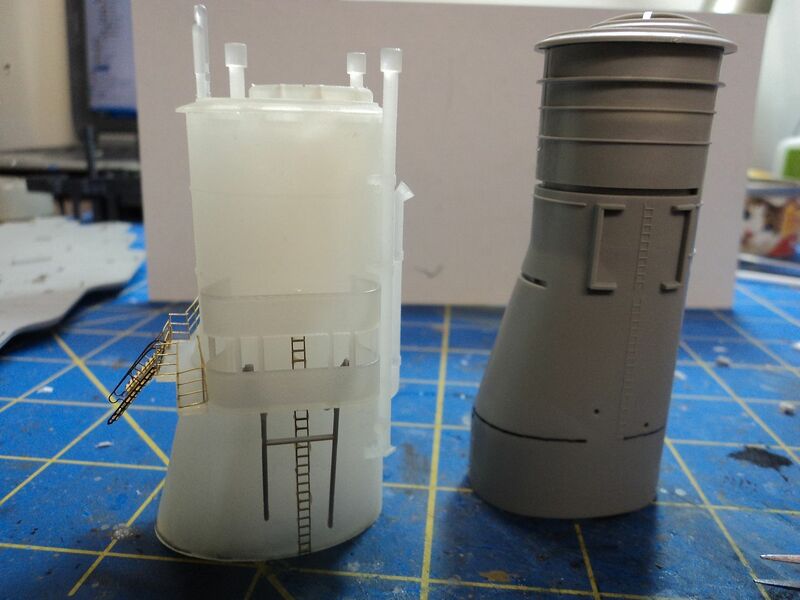 If not, consider casting a kit copy in resin..
Mark - Yes, feel free to use this thread for you sharing! Casey - Nothing wrong with getting things in order before you set sail! As for color... That is an interesting question that more often than not sparks lets call it, contentious debate, especially as it pertains to the color on the 7th of December. After reading a tremendous amount of blogs and articles on this, all that told me is there are a bunch of people that believe one thing and a bunch something else! Basically the argument is whether she was dark grey (5D) or Sea Blue (5S) like the other ships on battleship rob at the time. I know Tracy White is one of the foremost authorities on this subject...he might even pop in hopefully and give his take. With that though...How do you want here to look? I ask because I love her painted anyway someone chooses to go. Personally I feel she was painted the Sea Blue (5S) which was an almost blackish blue with light grey tops (5L). 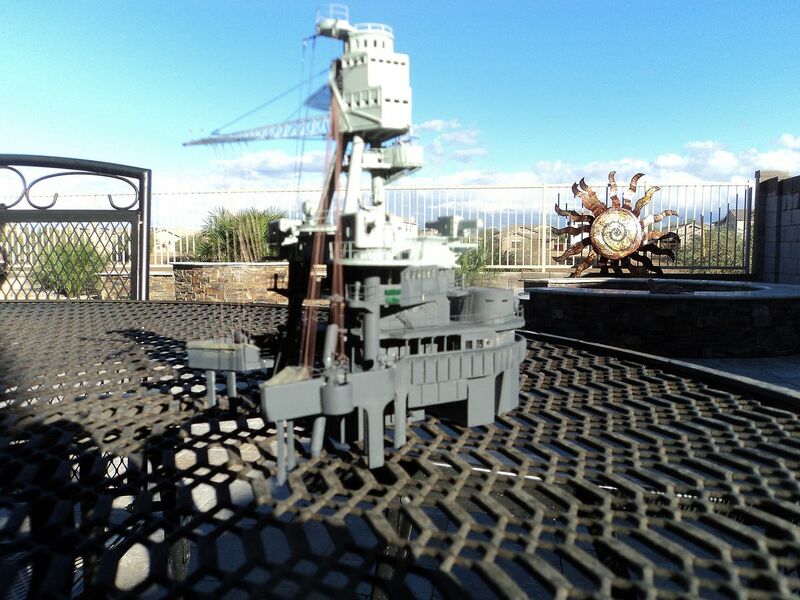 As for the decks...most likely they were dark grey or Sea blue...both wood and metal. Personally I like the wooden contrast with unpainted wood and painted metal decks....but that is just me. The model at the Museum looks dark, but in actuality, that would be lighter than the 5S Sea Blue...again, almost black. Looking forward to seeing what you come up with...no matter how she is colored, she is a beauty!! 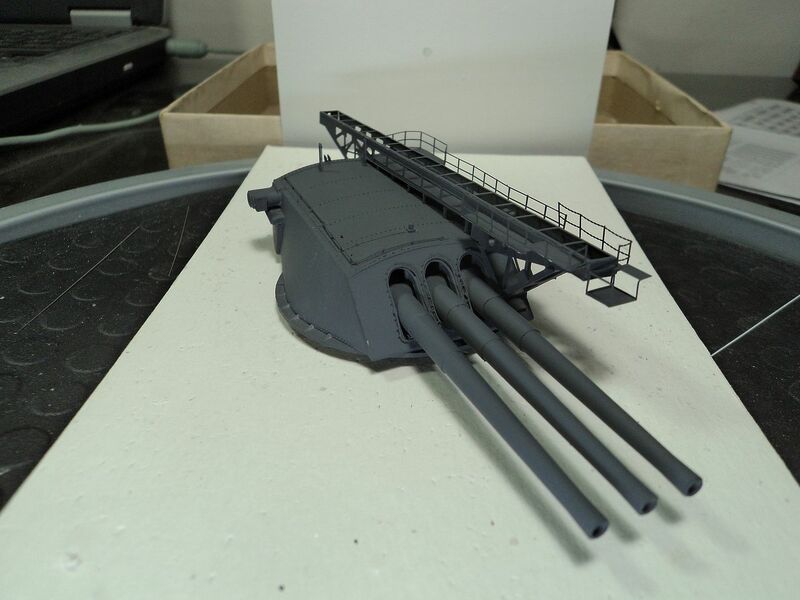 Okay, for my entry I will be using the Trumpeter 1/200 Arizona kit converted to the Pennsylvania as it appeared prior and up to the 7 December 1941. For references I will be using the following. 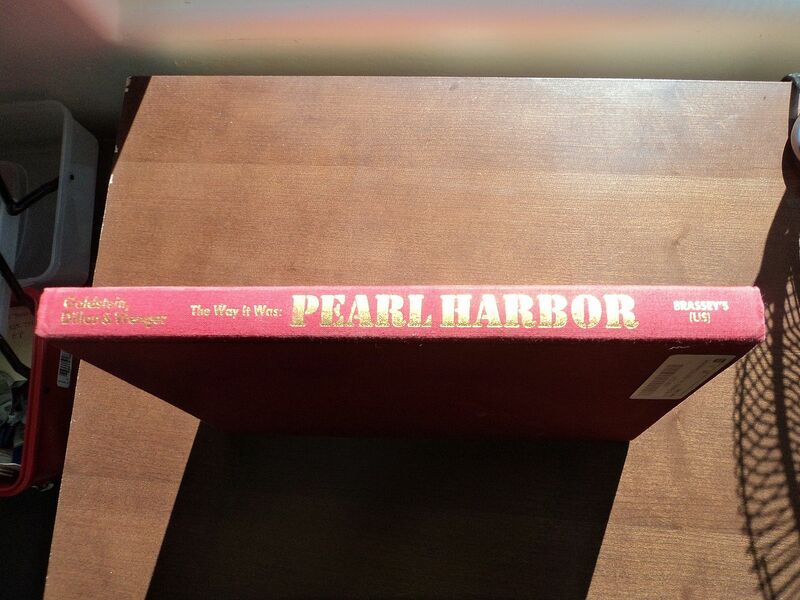 The Way it was: Pearl Harbor. 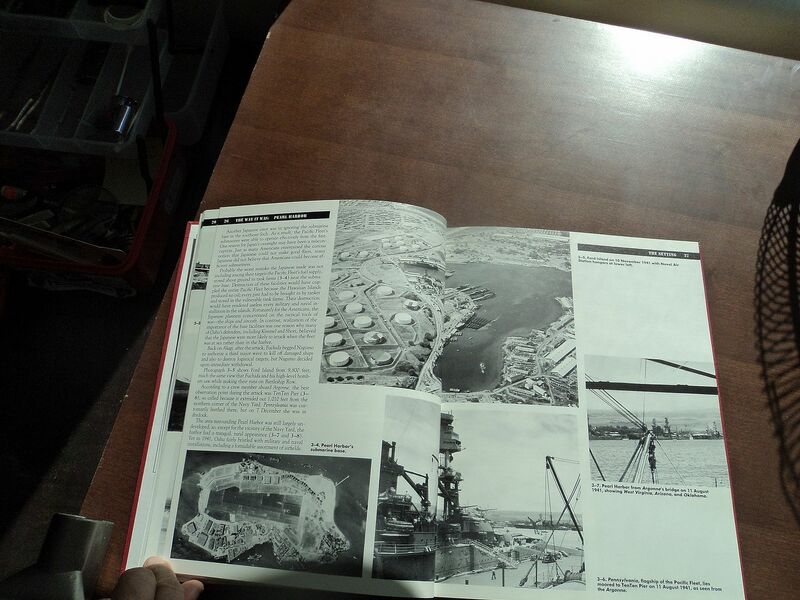 A DVD from Floating Drydock entitled PSBB38, with text and photo's for reference, as well as the photo's from Mare Island taken in March 1942 and other photo sources. Pennsylvania served in 13 Major Amphibious operations from Attu in the Aleutians to Lingayen Gulf. 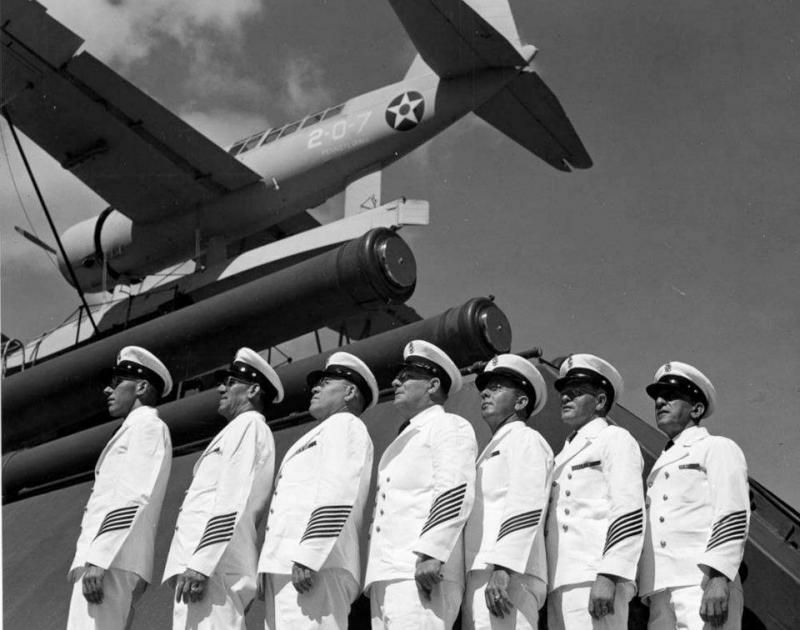 After the attack it went to Bremerton for repairs and from thence to Mare Island California for updates to the anti aircraft suite. 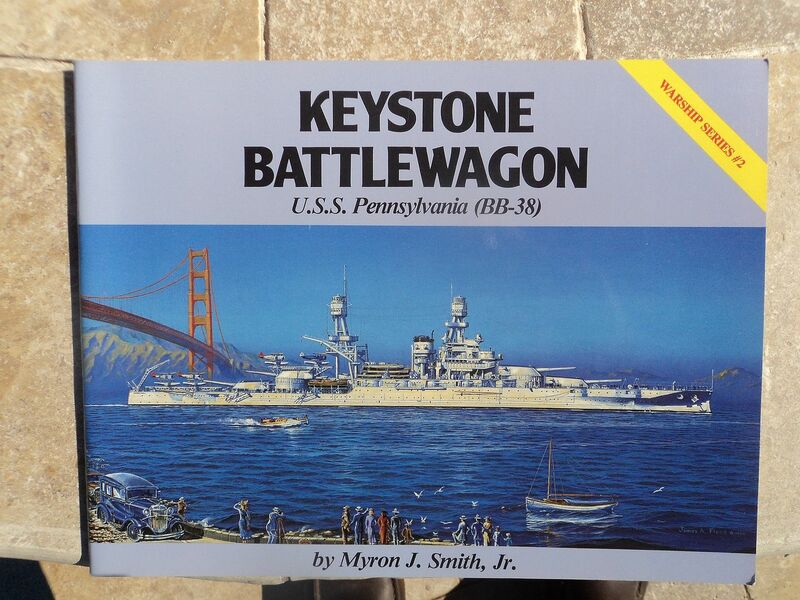 It was the only Battleship in WWII to receive the Navy Unit Citation. After the war it was a test for the Atomic Bomb in Bikini and was scuttled on 20 February 1948. The Pennsylvania, BB-38 was the class leader which included the Arizona BB-39. Although sister ships and similar in appearane, there were many differences making them fraternal twins vice Identical twins. 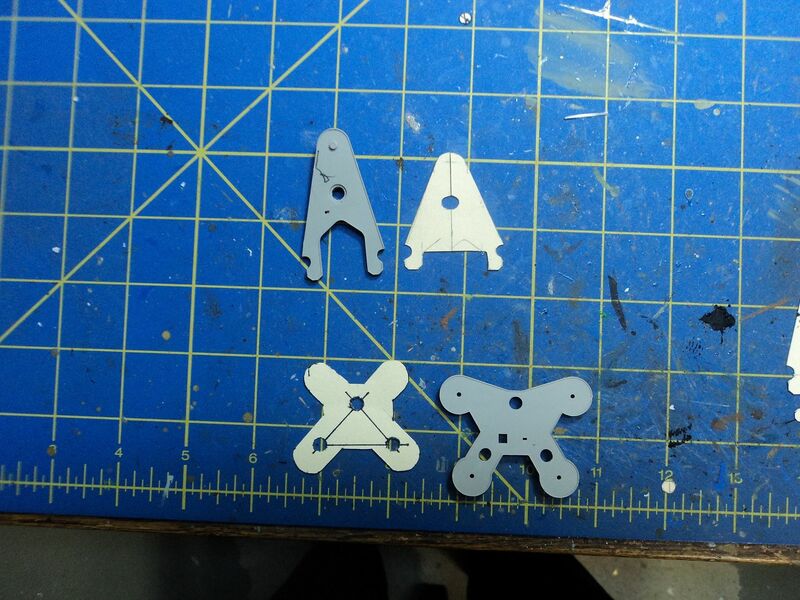 During this build log you will see what those differences were/are. 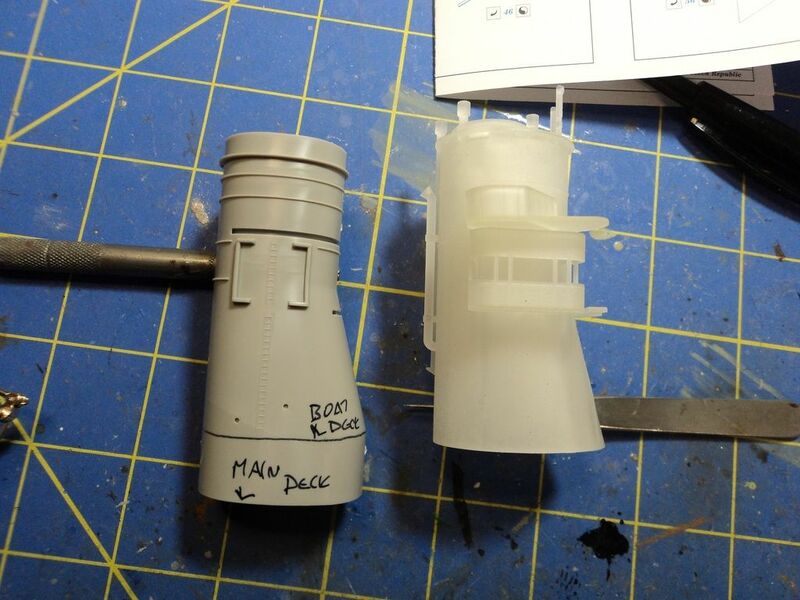 Lot's of neat stuff for the Ship Modeler. 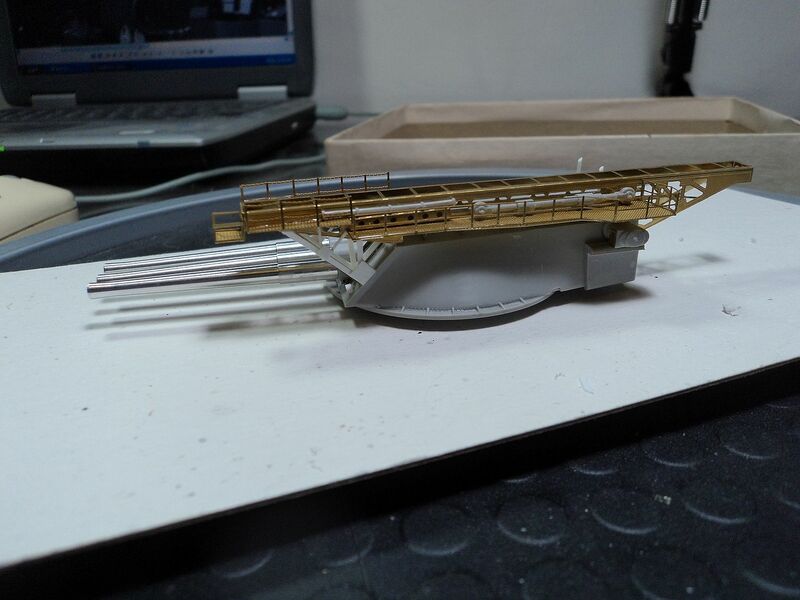 I received the Superstructure and started to fit the Trumpeter kit parts into the 3D printed part. 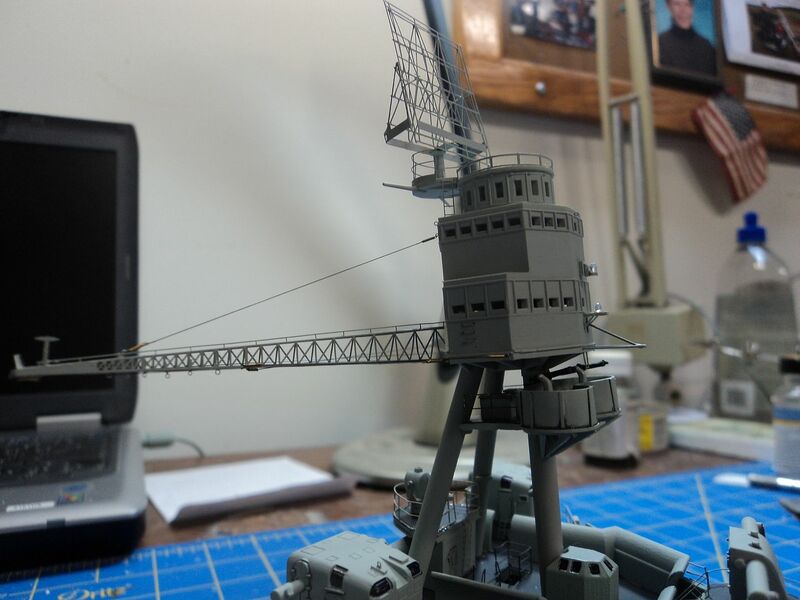 I had to drill holes for all of the supports, searchlights, signal lamps, as well as fabricate flag boxes, platforms, mounts and other items using the photo's from the Mare Island refit as a guide. 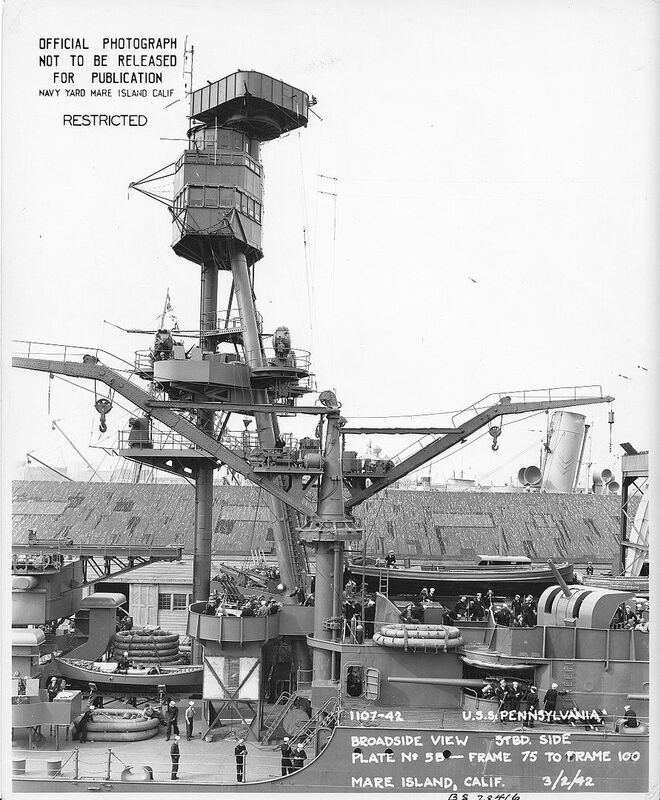 Once this was accomplished and all the PE was in place, I had to figure out where the searchlights, pelorus, and other deck fittings went, again referring to the Mare island Photo's. 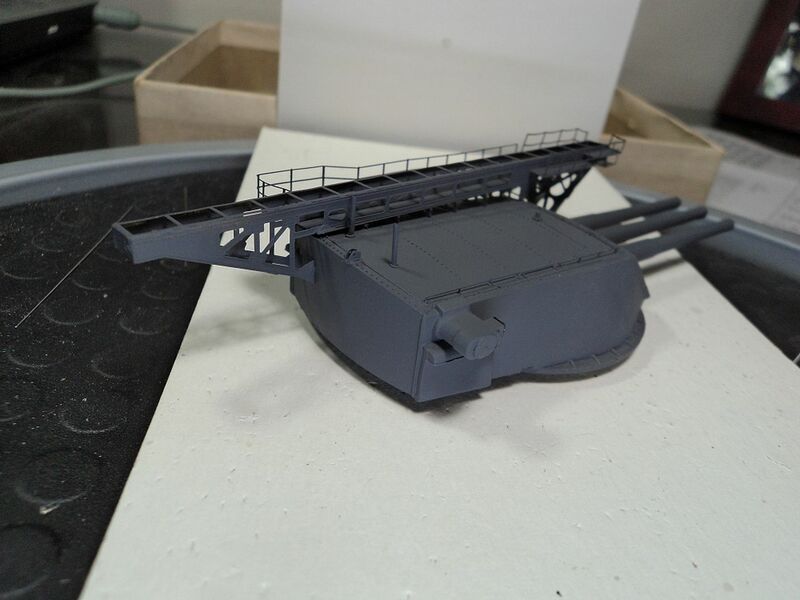 I also noted that the signal platform as 3D printed represents the platform as it appeared at Mare Island. I found this out after I had it completed. 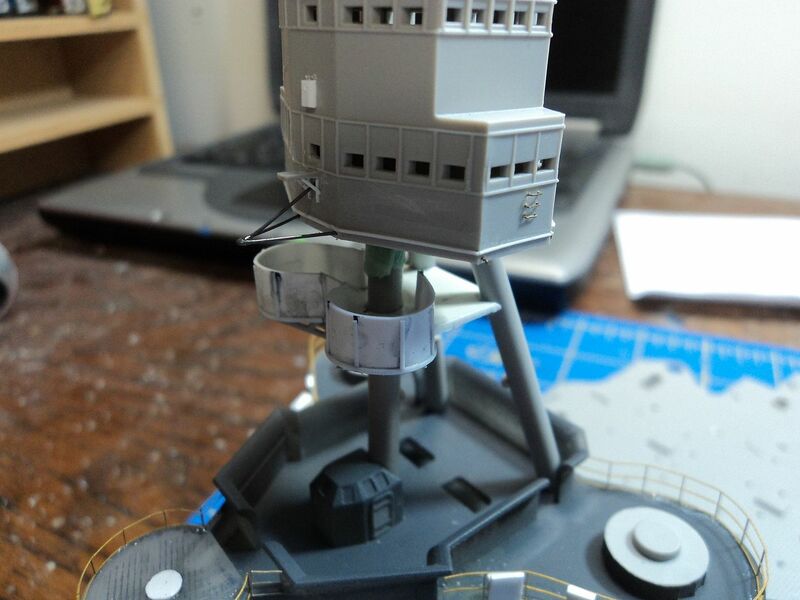 In looking at various photo's that I had acquired after I had the superstructure finished I noticed that the at Pearl the signal platform was enclosed in railings not the splinter shields as molded. Oh well, a small compromise to accuracy. 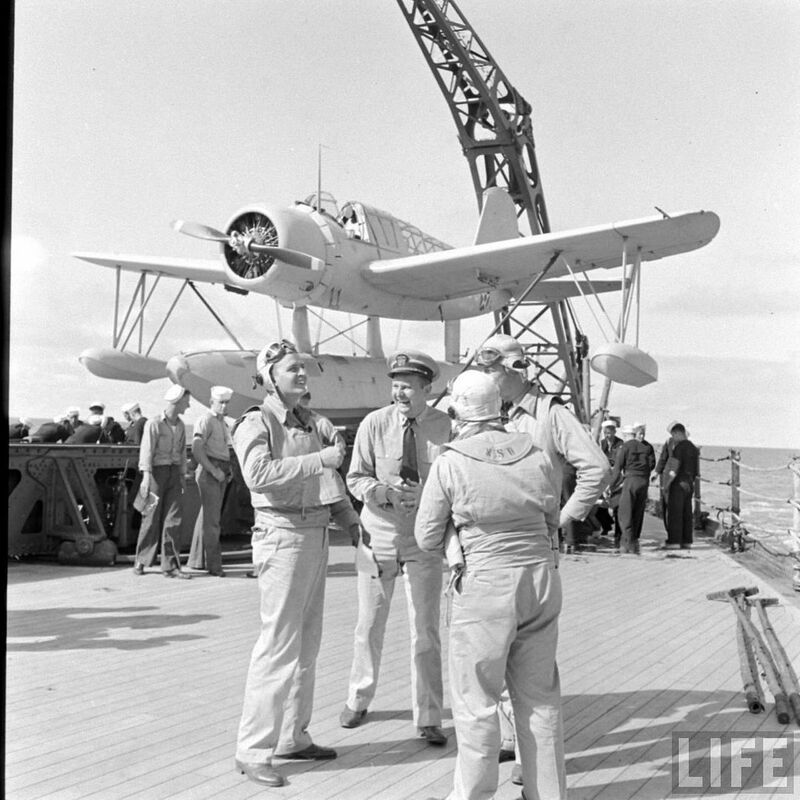 In scoping out some of the photo's I could tell there was a searchlight platform aft on the air defense level. Through the smoke and haze you can make out the searchlight platform. I will post more later as I try to figure out where I am in this build log. 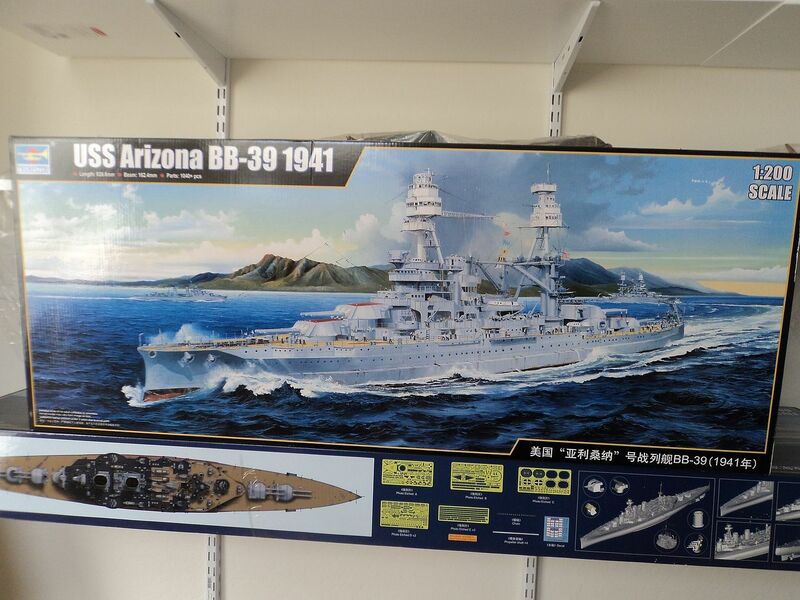 I started this project back in December of 2015, interrupted by a move to Arizona in July 2016, finally getting my stuff in September, getting my model room set up in smaller quarters, making repairs to what I had accomplished, I am now back at it. I was informed I could join the Campaign, present progress notwithstanding. 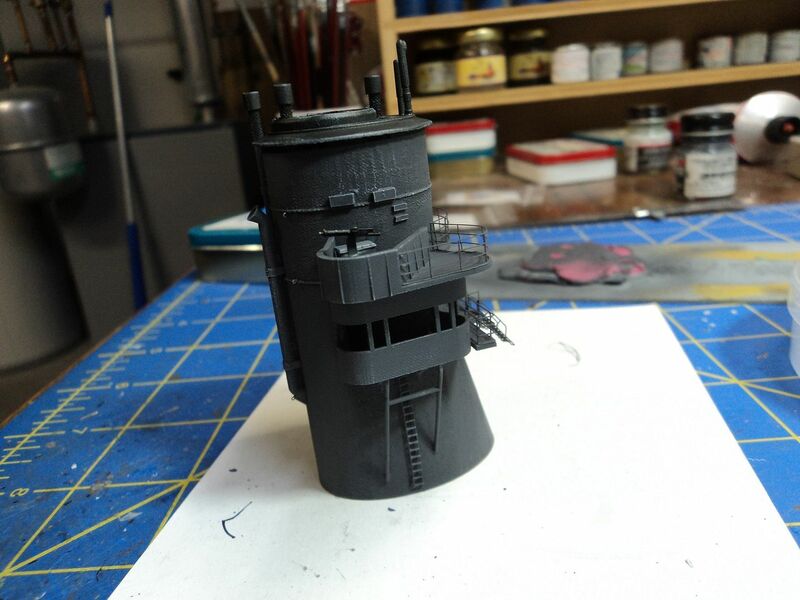 Stay tuned for more modeling excitement as I complete the superstructure and fore top. Sweet Mark!! Off to a fantastic start! Great looking 3D upgrade! Looking forward to following along!! Okay, more updates. So, to back up, I had to add the stanchions that are unique the Pennsylvania. 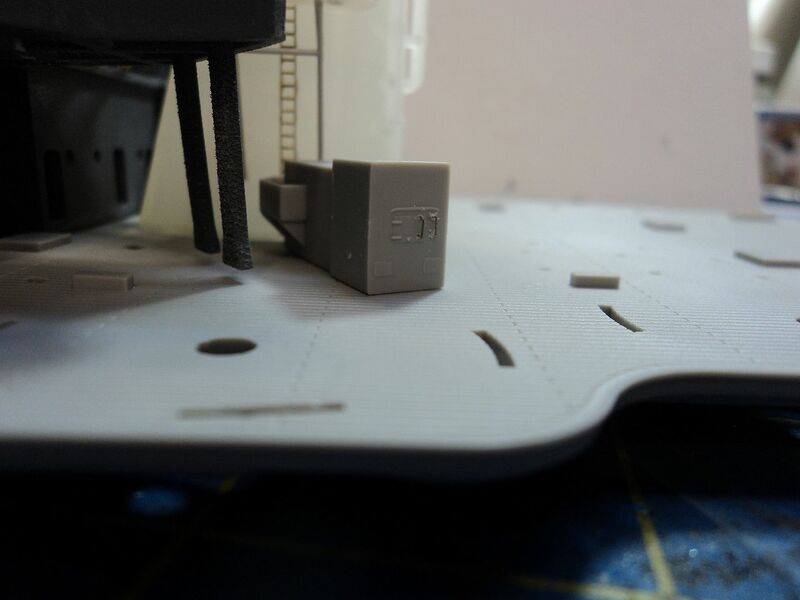 The 3D printing process printed the supports on the underside so no guess work. In the image below you can see the stanchions in their correct place. 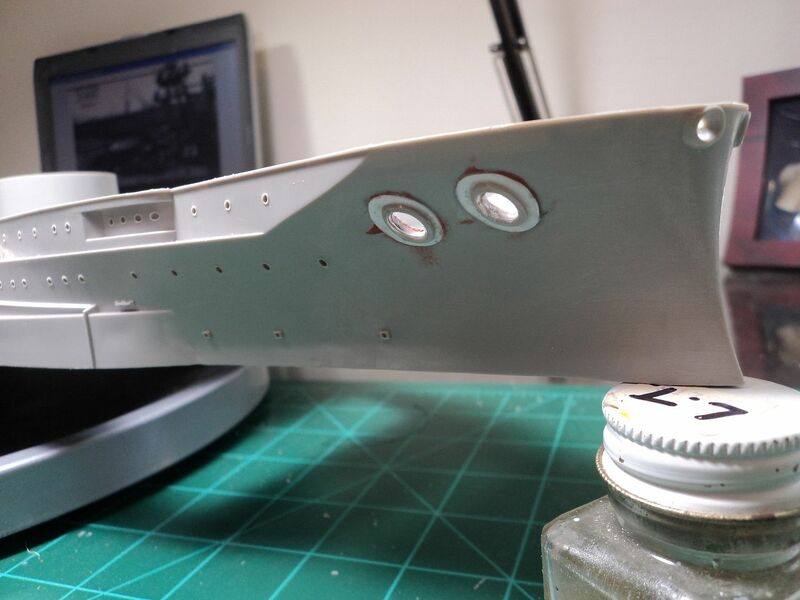 As this assembly went together I was able to put clear acetate behind the bridge bulkheads to simulate the windows. In this image you can see the flag bags. I used sheet plastic, eyelets and rod for the front and back. 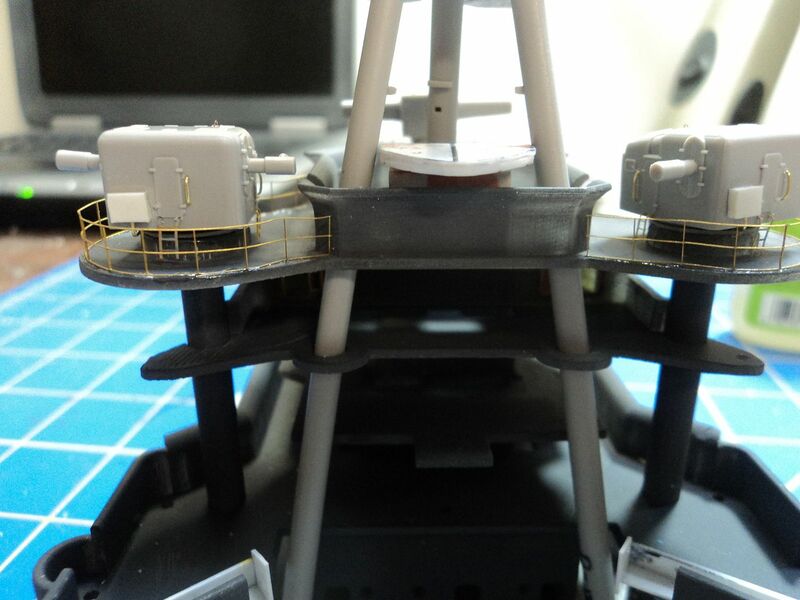 For the searchlights and signal lamps I had to raise them a bit by putting a shim of sheet plastic between the lamp and the deck. In this image of the armored citadel, I used a periscope off the Arizona kit, PE Railings and some ladders for access to the top. 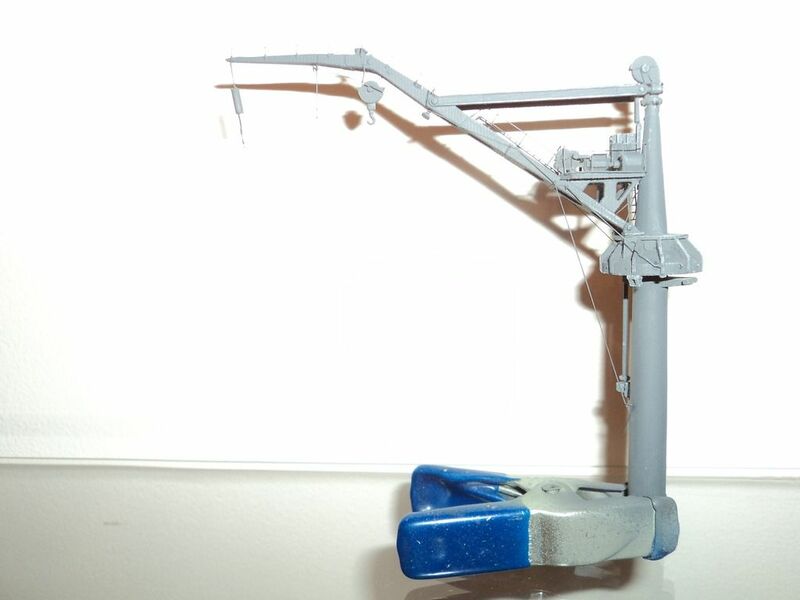 I also used brass rod for future rigging attachment points, as there were antenna trunks, antenna wires and stays all in the same area. 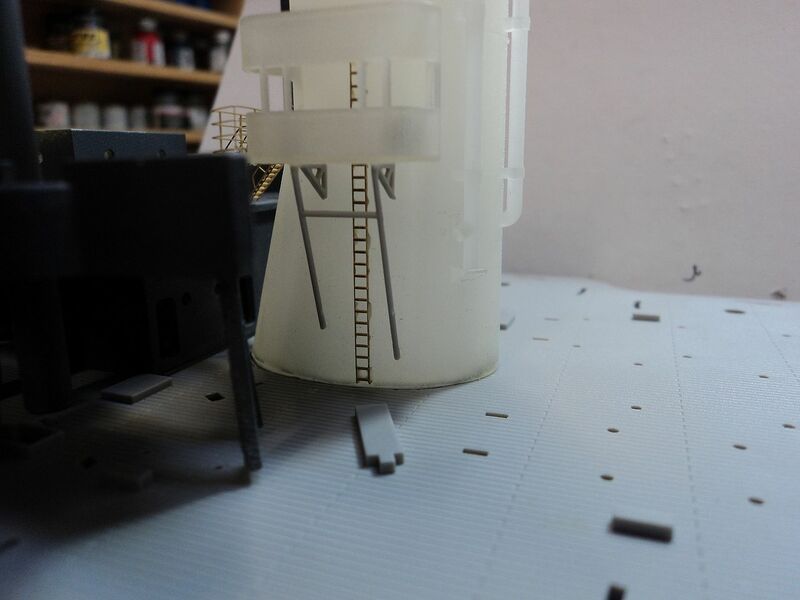 In this image I added Tom's Modelworks doors to the already open access ports to the super structure. 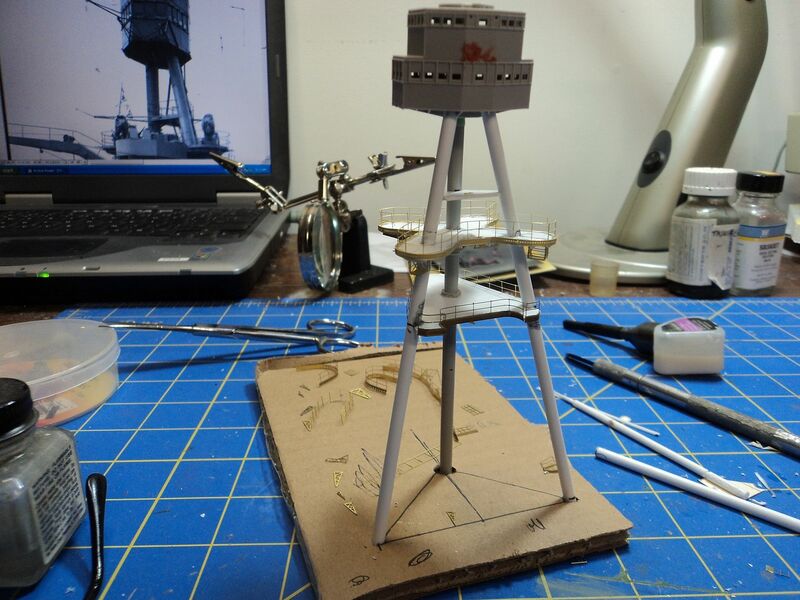 Moving up the superstructure, I wanted to get the foretop and foremast finished to assemble it as one unit. 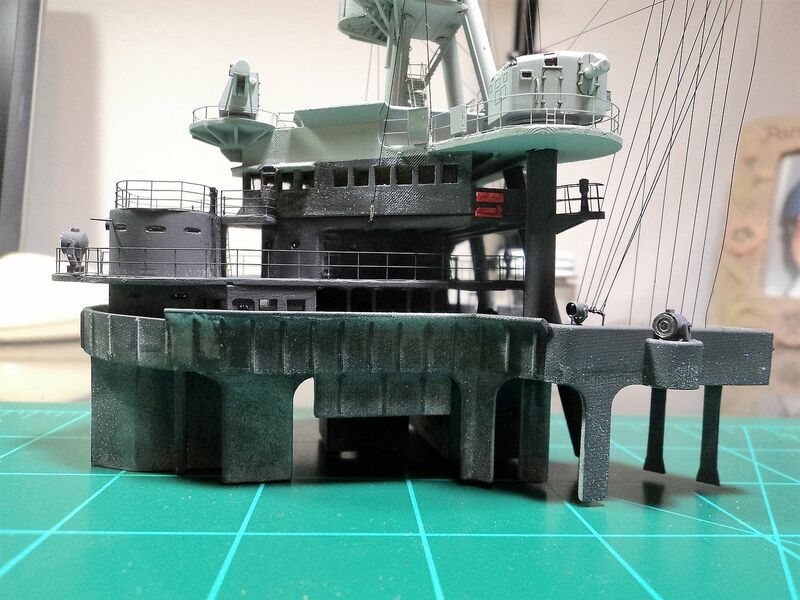 By looking at the photo of the foretop taken from a distance, the modeler can clearly see the light configuration, the CAXM radar and the attachment for the line going to the jack staff. Working from the top down I added the light mount, the line attachment bracket, an eyelet on the top for future rigging. 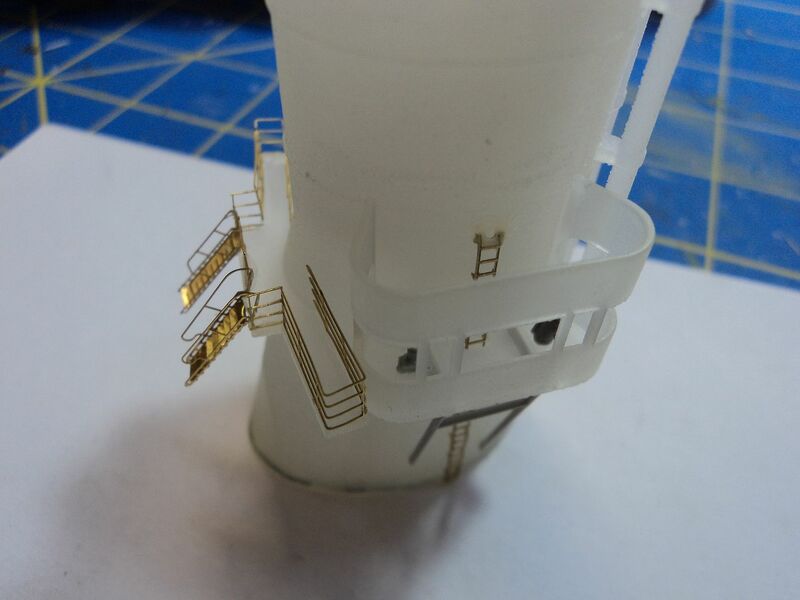 Using strip plastic I added some detail along the bottom of the top and ladder rungs. TO give the PE lattice yard something to "grab" onto, I added these bits of sheet plastic, once painted they become invisible. Whilst forming the lattice yard, I added a bit of cut PE for a hand rail on the top portion. 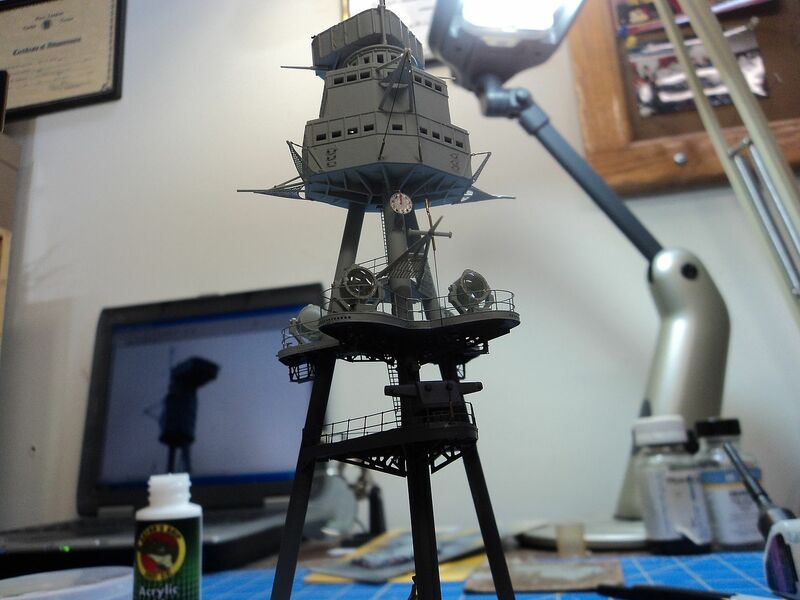 Here is a view of the completed top. 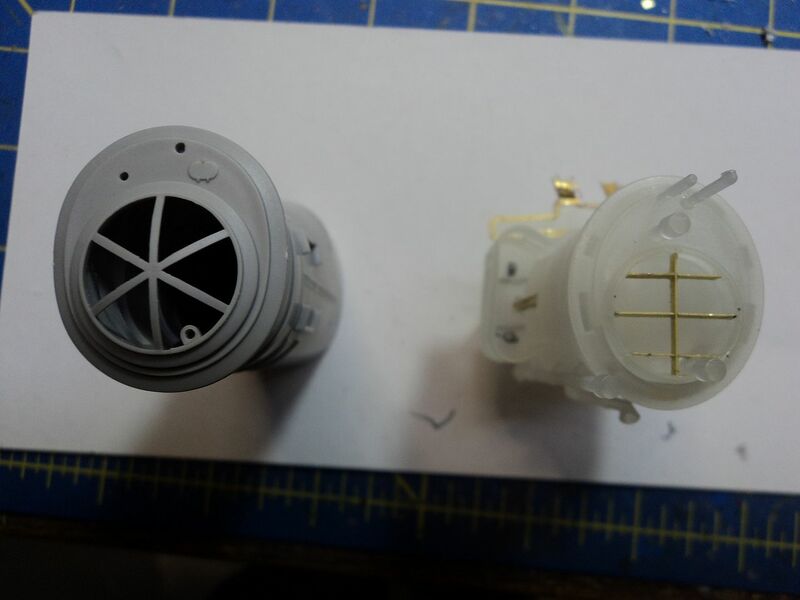 For the light lenses I cut the tips off the bombs that are included in the Kingfisher kit. 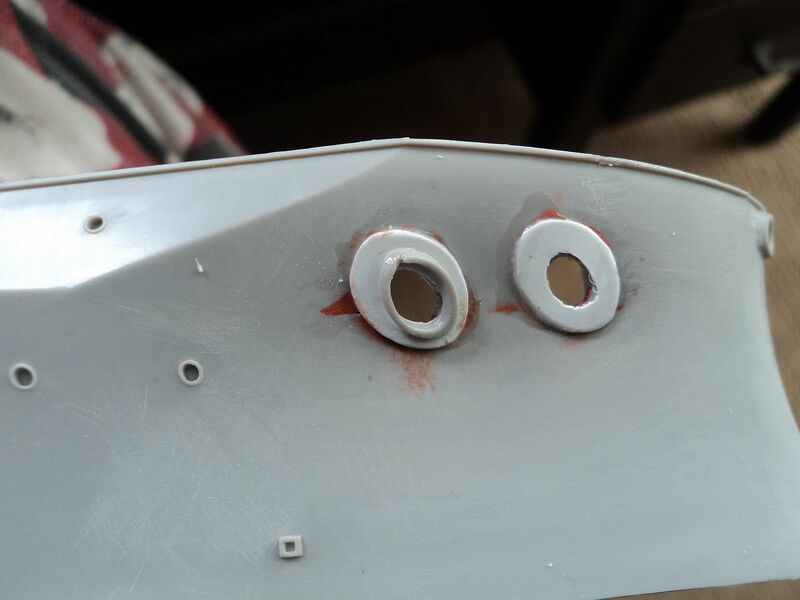 Prior to attaching and painting I added eyelets to the underside of the yard for the halyards to slide through. 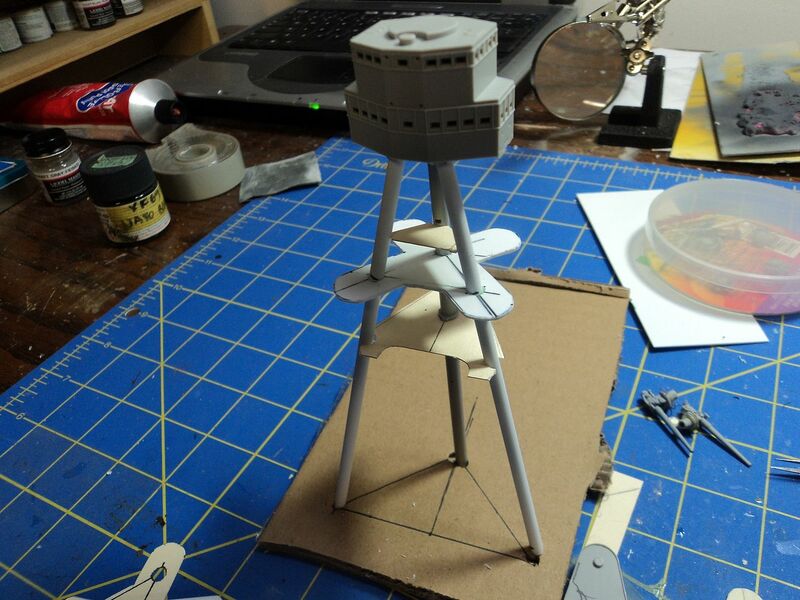 I also added some spare PE to simulate the weather vane and the anemometers that graced the outer edges of the yards. Here is the backside. 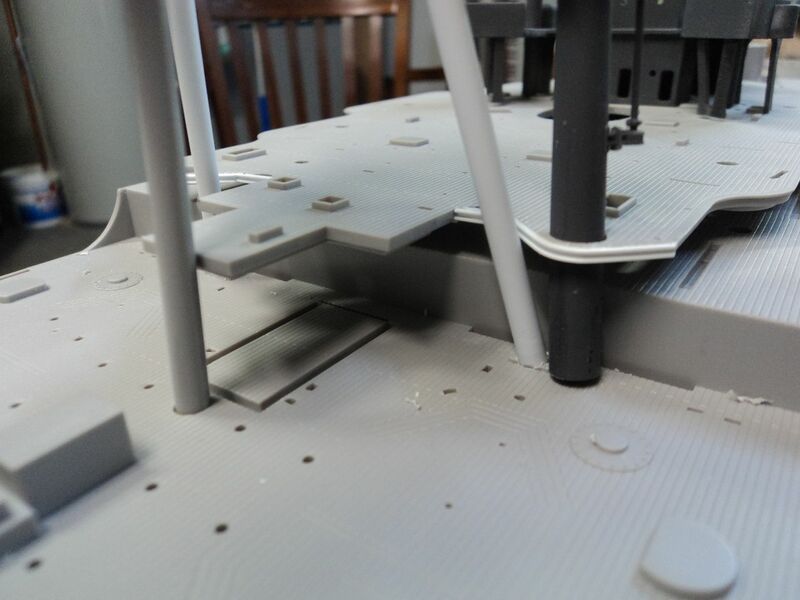 As you can see the supports pretty much disappear when painted. 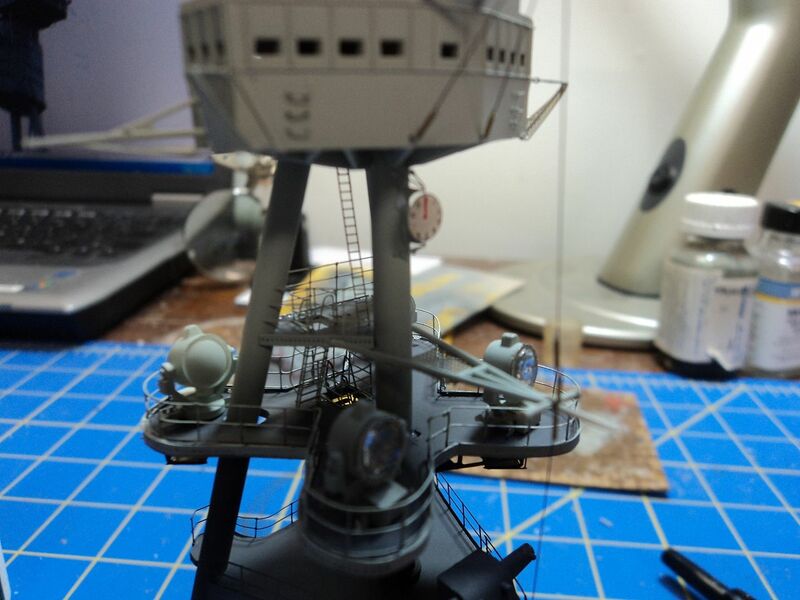 I added eyelets to the foretop for stay attachments and ladder rungs to the backside. They are a trick to line up. 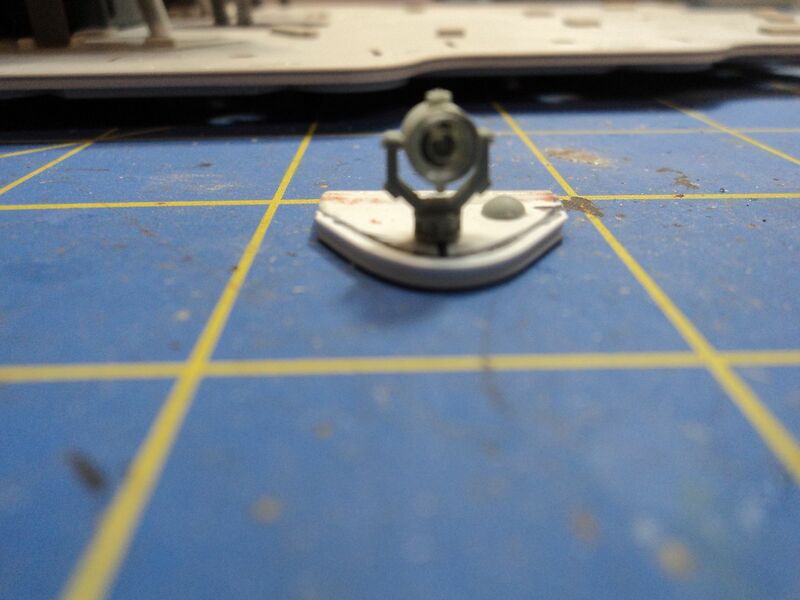 In this view you can see the machine gun platform to better affect. 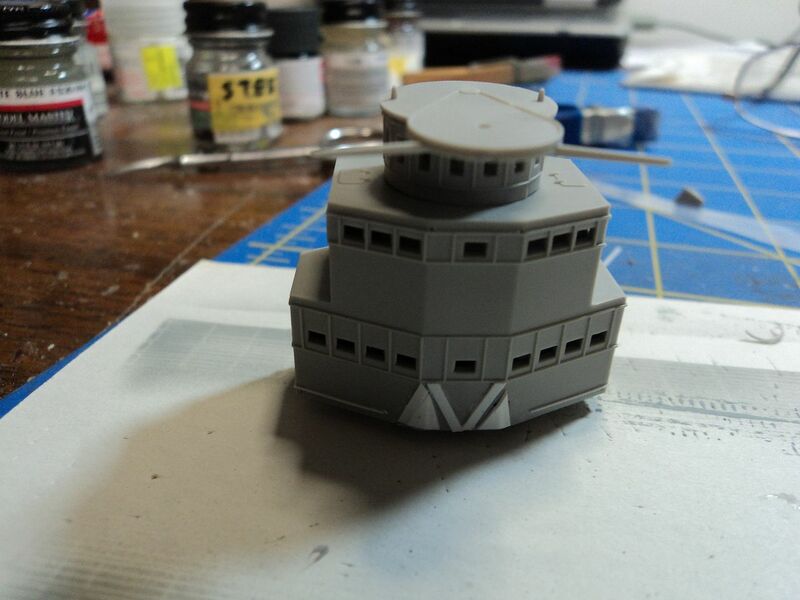 Moving on to the gun directors on the air defense platform. 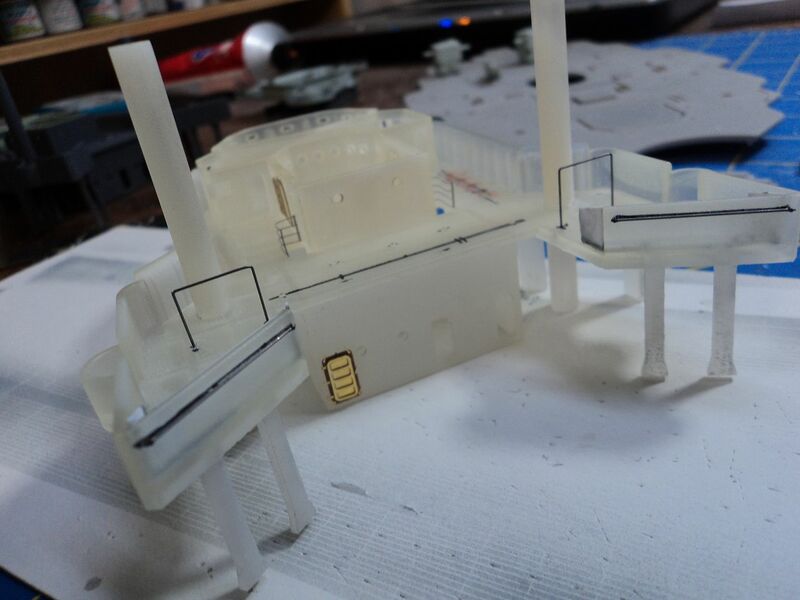 I added brass railings to the sides by the doors, for an electrical box I used a chunk of plastic with a brass wire for the conduit and PE ladders. I also added an eyelet to the foreward top portion. I think it was an antenna. I also added a chunk of plastic to the railing. I am not sure what it was on the real ship but probably a junction box of some sort. 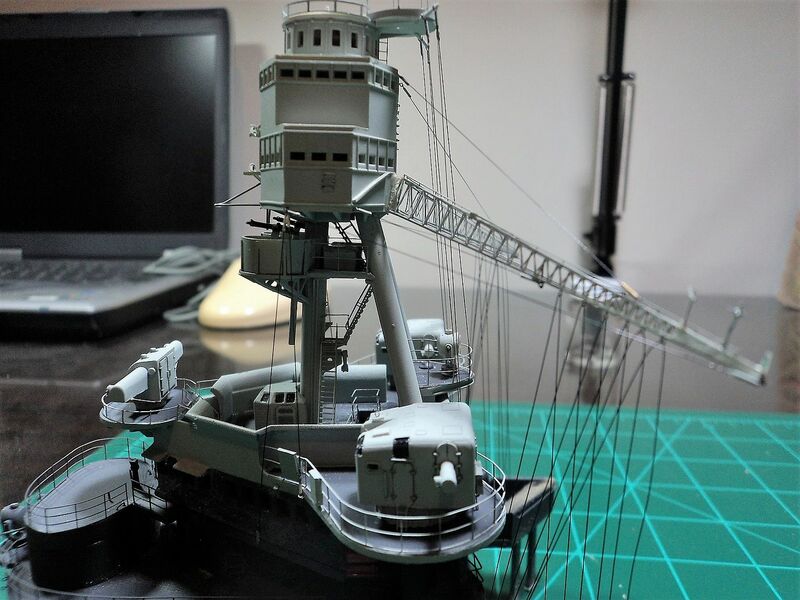 Referring back to this image you can see the platforms and ladder arrangement on the foremast. I tried to duplicate that with sheet plastic, PE ladders and bits and bobs of plastic. I detailed the gun directors with a wash of AK washes for ships, and a fine point sharpie for the glazing on the directors. For the 5-D I use Tamiya XF-24. For the light grey 5-L I used a mixture to match WEM Color Coats 5-L. The Lighting gives it a more greenish cast than it shows in person. I also added bits of fine rod to simulate the conduit and piping attached to the legs. 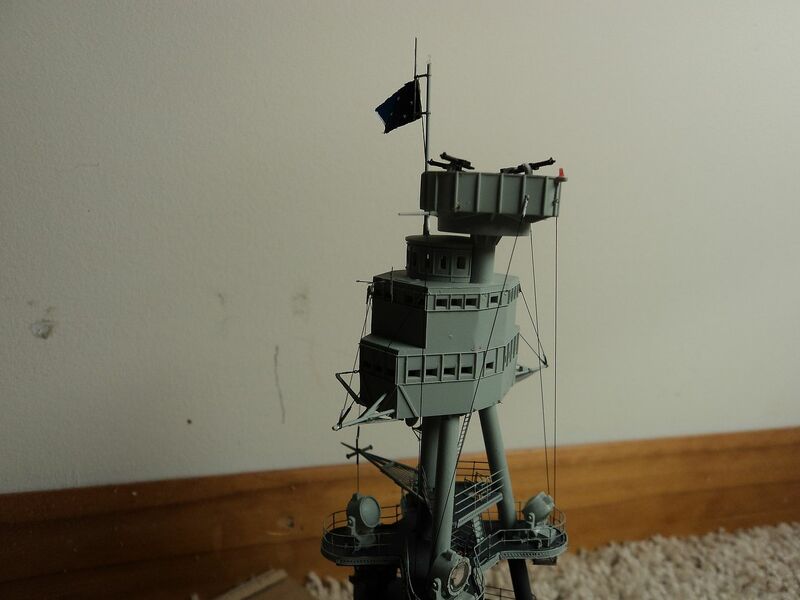 Below is the completed superstructure/foremast assembly. 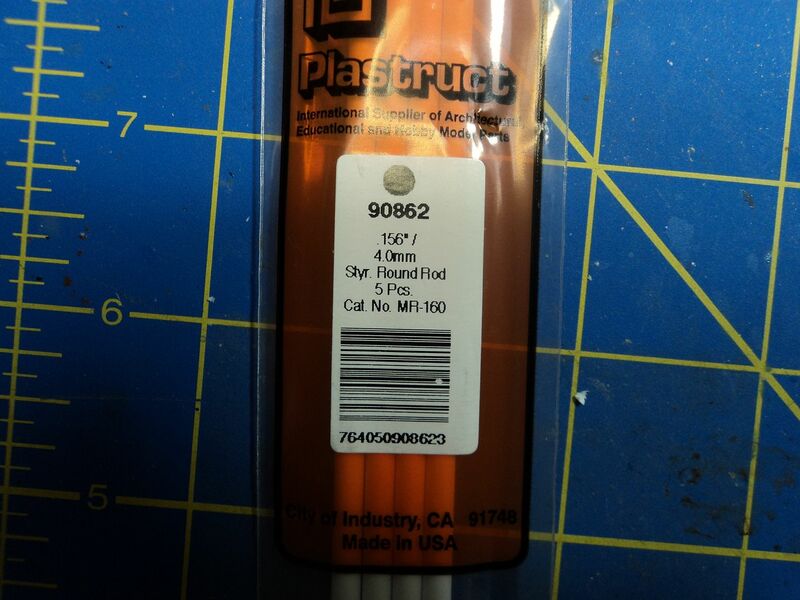 For Rigging I used Model Kasten .06 stretch thread available from Sprue Brothers. A word of caution here. I use Tamiya acrylics thinned with Methyl Ethyl Ketone (MEK) I had no idea of the long term affect this stuff has. The 3D printed plastic doesn't like MEK. So I gave it a wash with a brush thinned with laquer thinner and the crystals seemed to disappear. I had used Gator GLue, a white glue designed for PE, well, it doesn't work if there is tension applied as in the case of the Lattice yards. So, off came all the rigging and clean up. I used new Lattice yards that I got from a buddy and used tan EZ line. It isn't what I was looking for, but it shows up and the halyards were a tan color not black, so I am content with it and happy with the way it turned. The CAXM radar was just sitting on the top for affect, it survived intact. At this juncture I also added the yard arm safety netting. 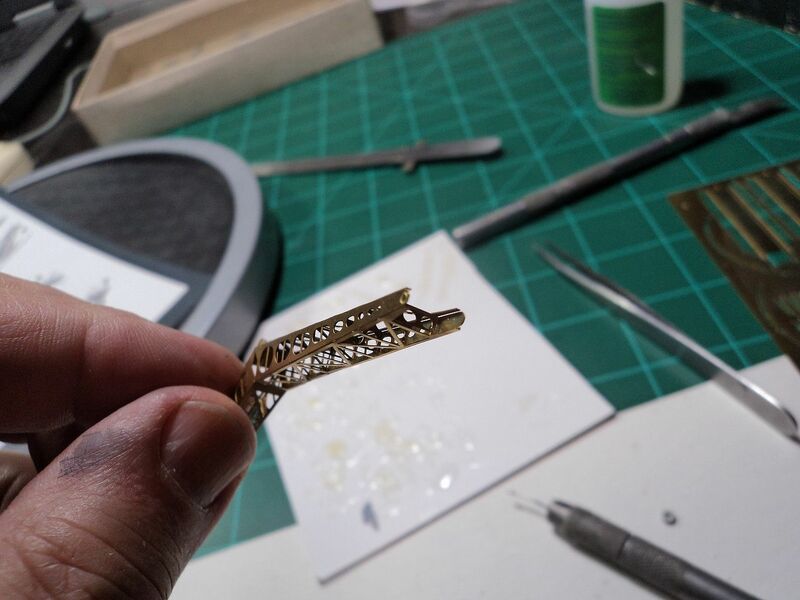 This is fine brass mesh cut to shape, given a wash of black and carefully glued with Testors Canopy Cement and placed into place. The Next area I addressed was the cranes. The Pennsylvania cranes are totally different from Arizona. Haply, Steve Larsen designed a set for the Pennsylvania. When Compared to Arizona, the difference is dramatic: Compare to this photo of Arizona at Puget Sound in January 1941. 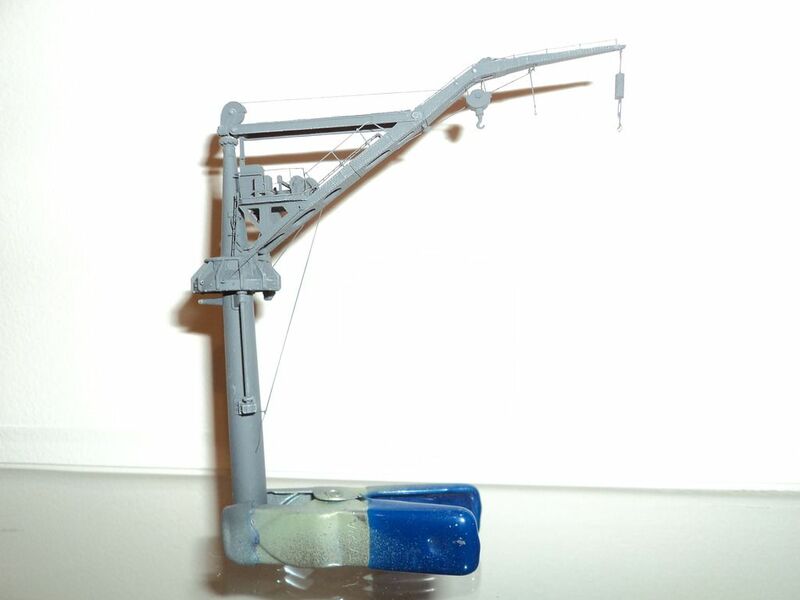 Using the Shapeways 3D printed cranes and parts off the Eudard PE for the Arizona, a Pennsylvania crane can be built. I added some eyelets for rigging and PE Ladders. So Folks. That's it for now. Looking to join in on this as my first build since I was 11! 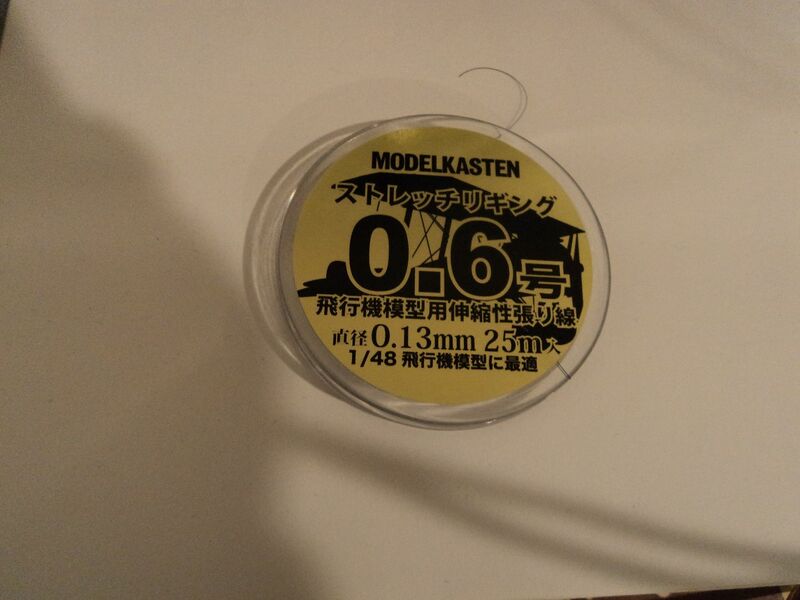 Got myself a Tamiya 1/350 Kagero - it didn't participate actively in the battle as far as I'm aware, but it was part of the Carrier Strike Force I believe. I'd love to have it be a dual diorama, Kagero and another ship (preferably another destroyer class), but I'm not sure what other ships would fit in with it? 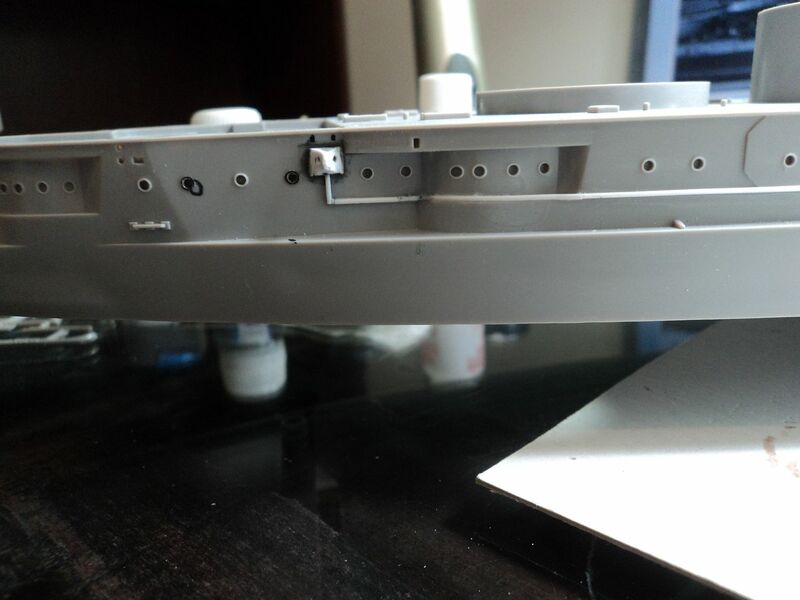 I haven't managed to find any 1/350 Asashio-class kits. Look forward to joining in! Mark, she is coming along nicely and I really like the rigging (which Ive never been able to accomplish) keep up the great work. Looking Great Mark, she'll be enormous ! And welcome back to the hobby Liam ! There are plenty of us newly-returned modellers around here. And plenty of veterans with loads of advice and help. 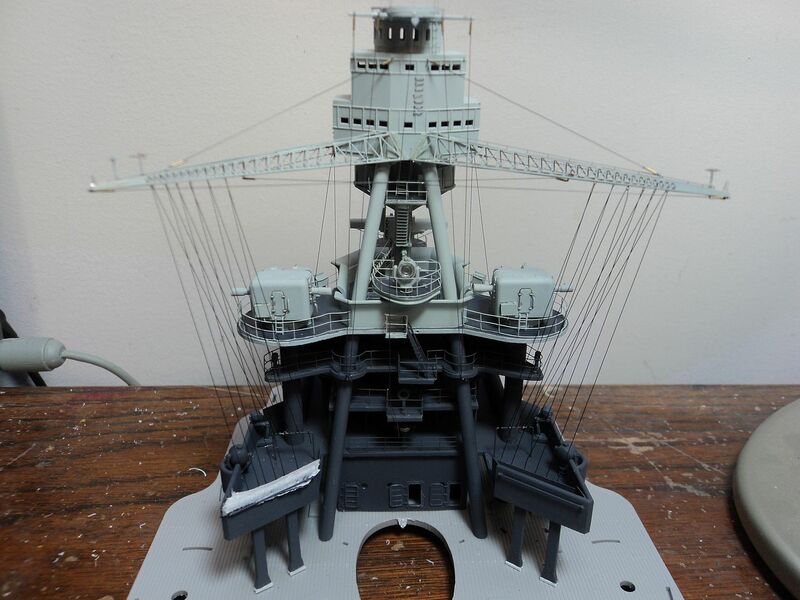 Is it possible to join the build with my 1/700 Fujimi Shokaku? 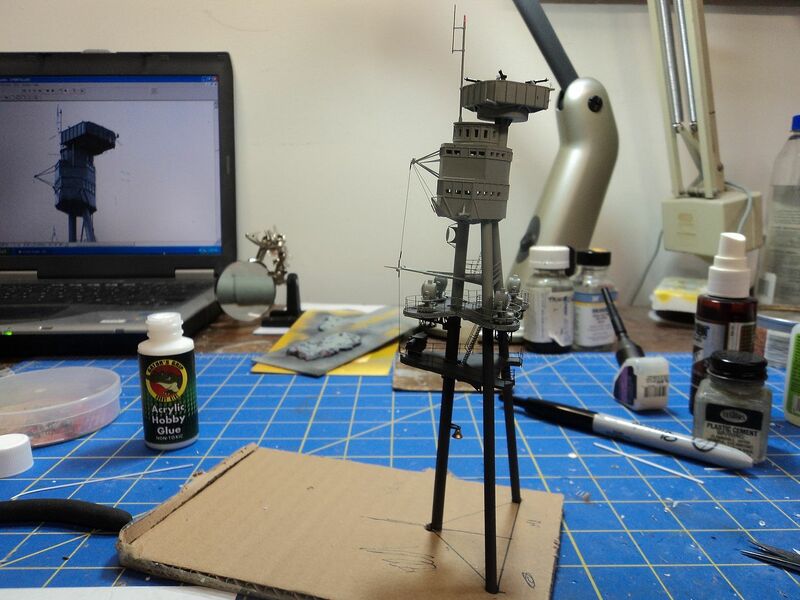 I started the model in August last year, but then it went to the shelf of doom. As you see not much progress was made. Looks like it's time to get it off the shelf of doom and get to work. The rules have been bent a little so you can enter it. Now I have a bigger reason to finish the model . 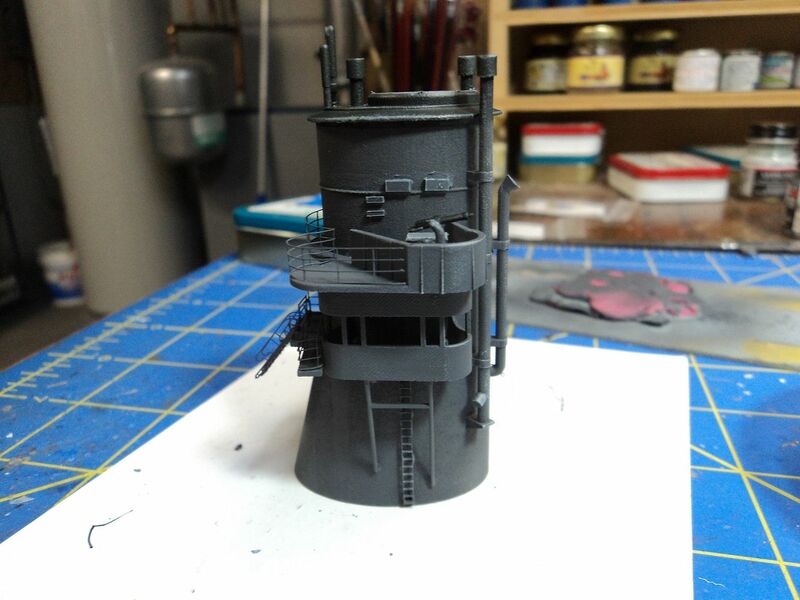 As said my model is the 1/700 Shokaku from Fujimi. 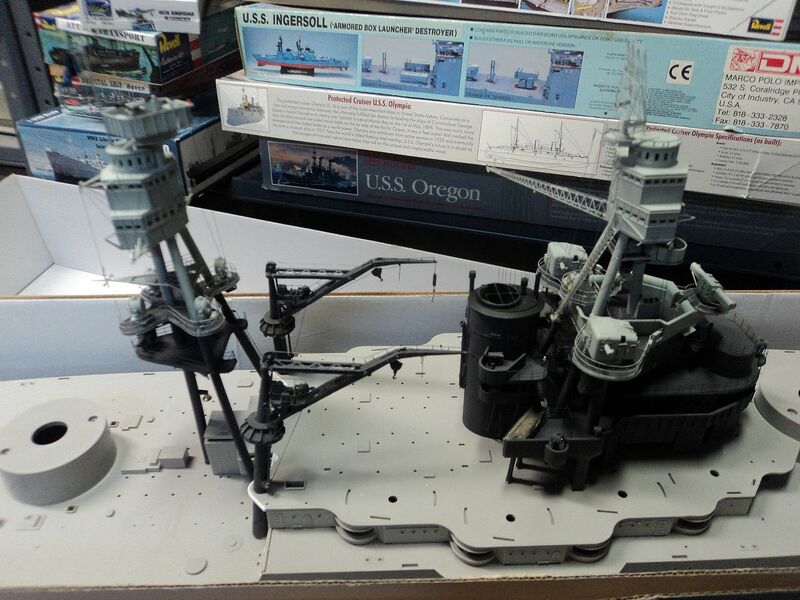 I will also use the pe set from Fujimi and the flightdeck from Flyhawk. There will be also other sets, wich I will note when I use them. I hope I can make some new pics this weekend. Here are the pics from last weekend before painting. 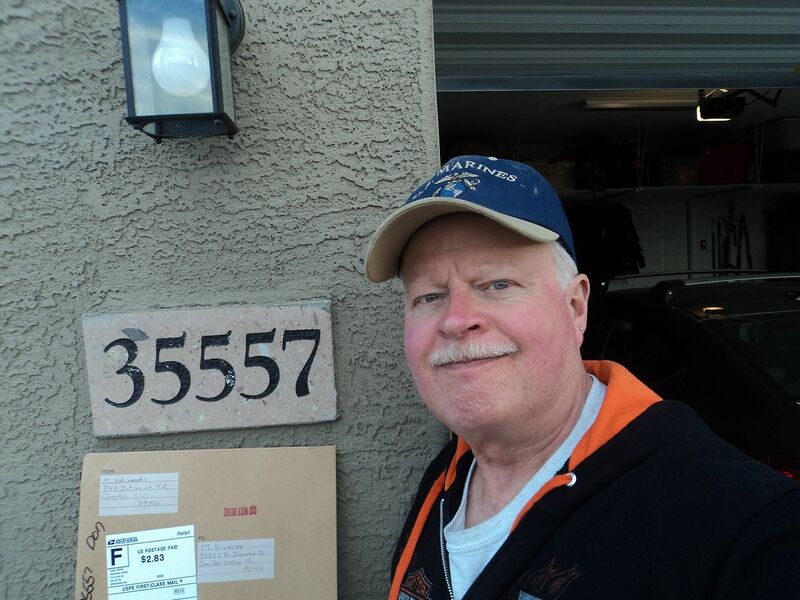 Thanks Bob and Paul: Appreciate the comments and you looking in. Yes it is a large piece of work. Welcome back to the world of modeling in the 21st Century. You will enjoy it. Christian, good to see you tackling this, looks good so far. Do I need to post my progress in this thread or can I create my own in one of the other subforums? I'd quite like to do a WIP thread for my Kagero. 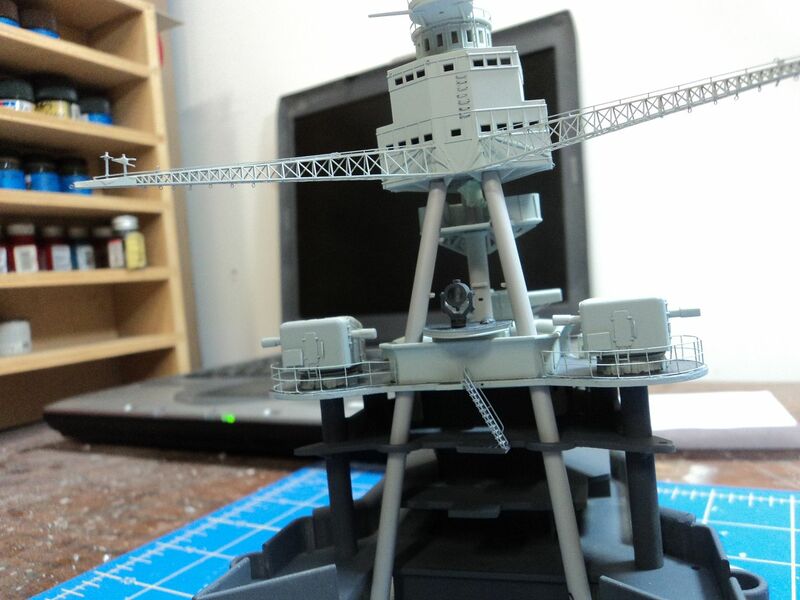 Okay: My next step in the construction was the main mast. Again, Pennsy's main mast is totally different from Arizona. 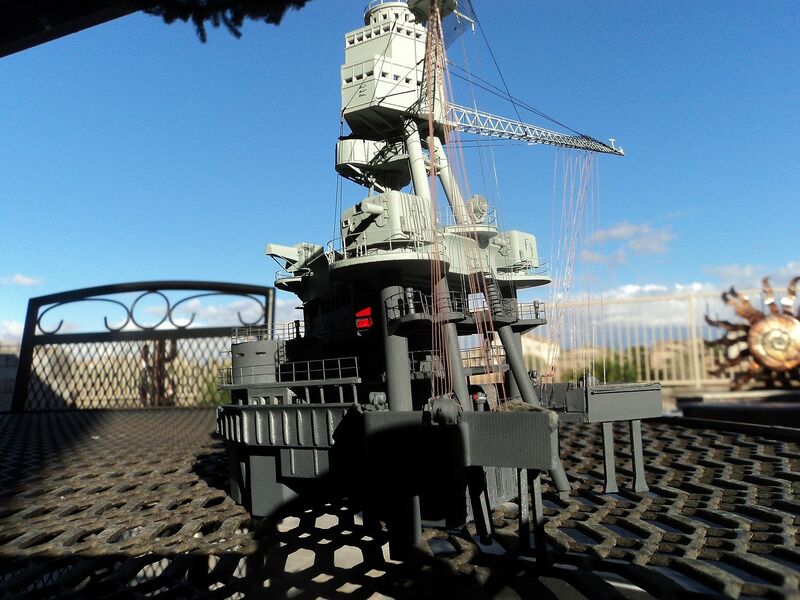 The main top doesn't have the forward antenna mount or antenna array that Arizona had. 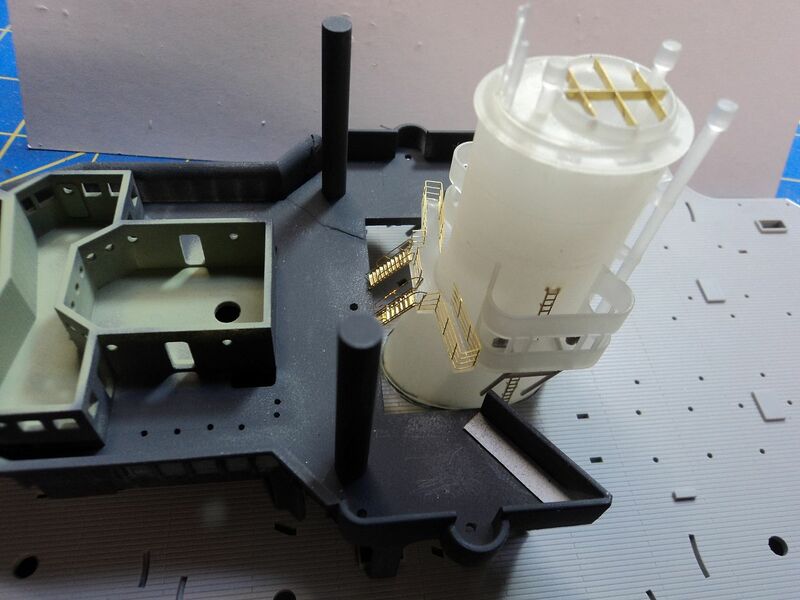 In the picture below, you can see that the main top is devoid the forward antenna mount. 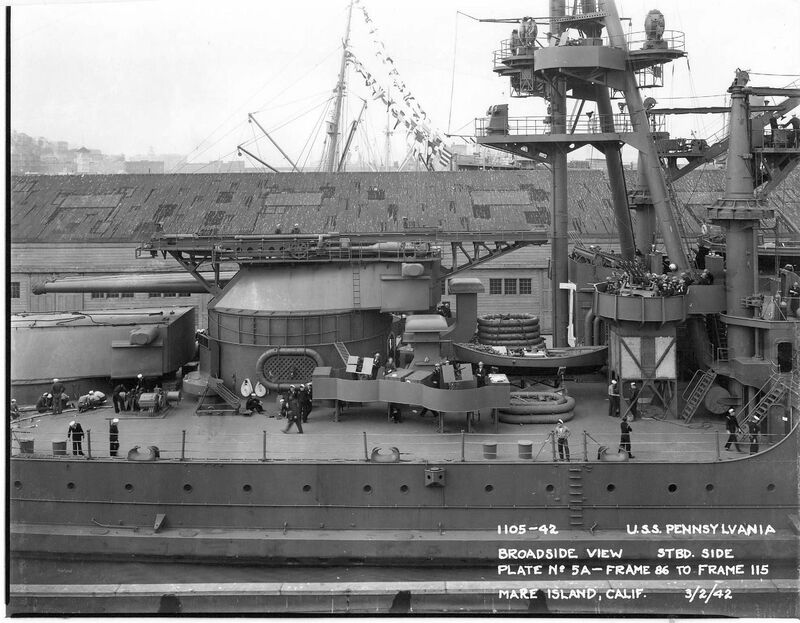 Whereas this taken at Mare Island in March of 1942, I wondered if the removal was part of the overall upgrade and modifications being done to her at that time. I found this photo of Pennsy at Drydock after the raid. 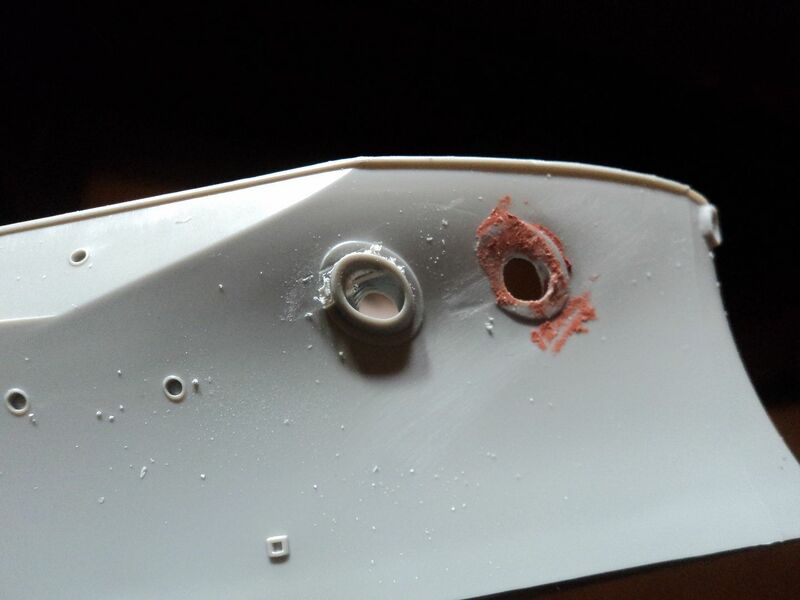 One can faintly see that the antenna mount is not present there as well. 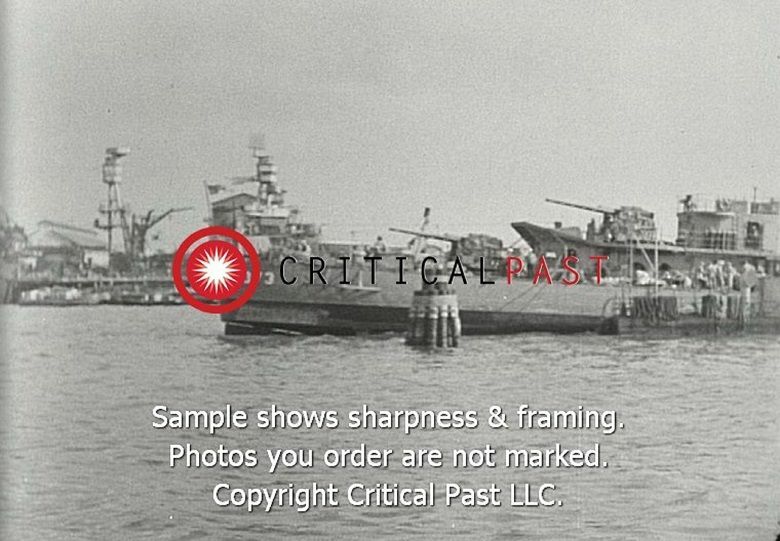 Nor is it visible in this photo taken at 1010 dock in about August of 1941. 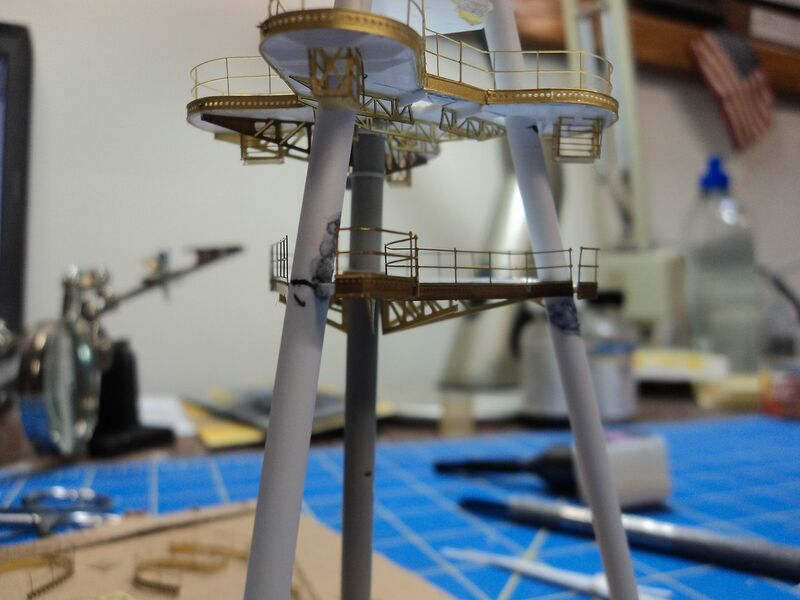 So, I went to work on the main mast. 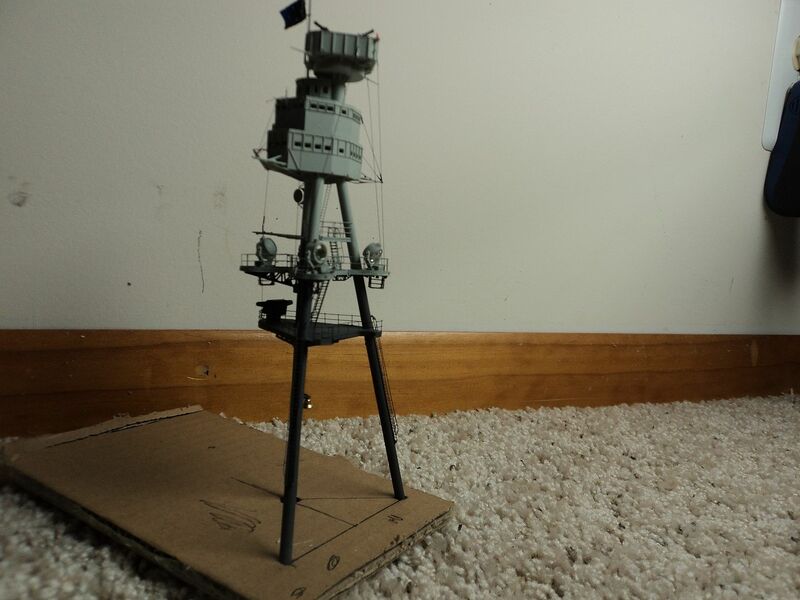 The forward legs of the tripod mast were further apart and at a more acute angle than Arizona's, so the geometry of the mast is totally different. There is also one less platform. I used card stock for templates based on the 1935 fit as drawn by Chesley in 1986. 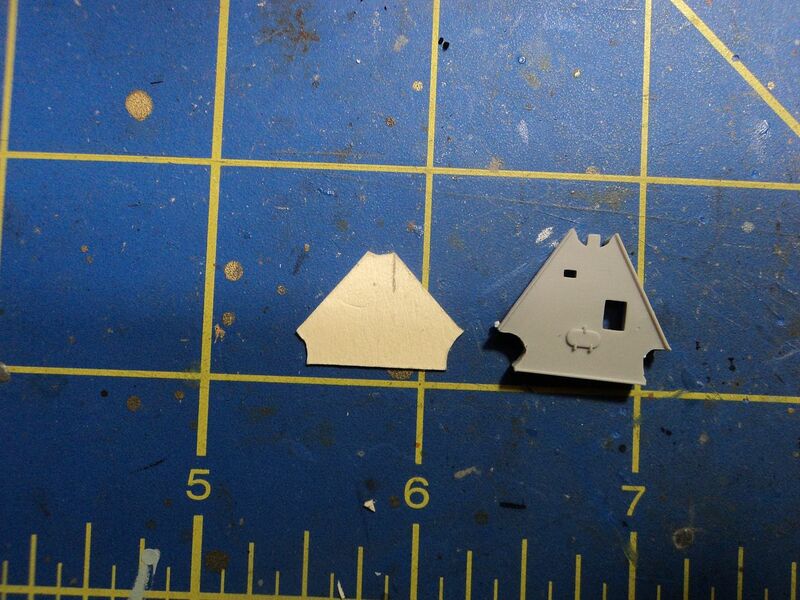 I then test fitted the templates. 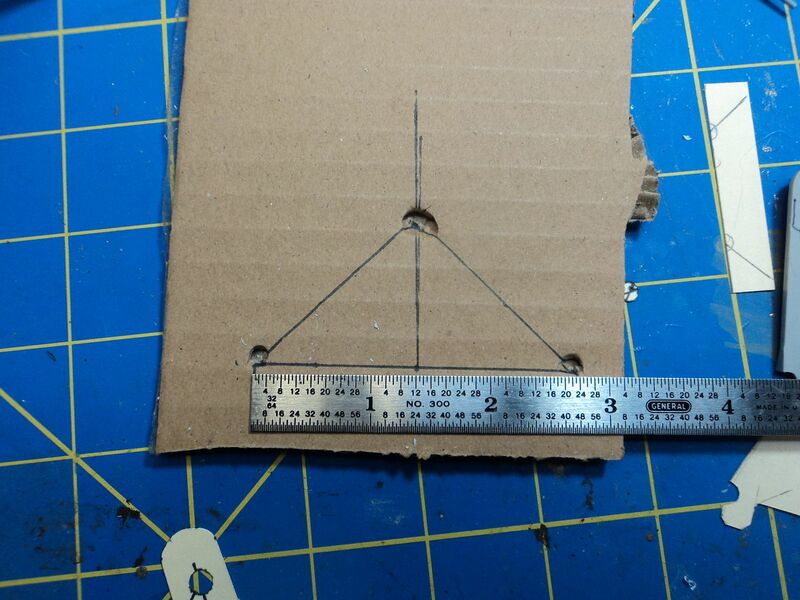 I then made a cardboard jig to support the structure. I had to use Plastruct rod. 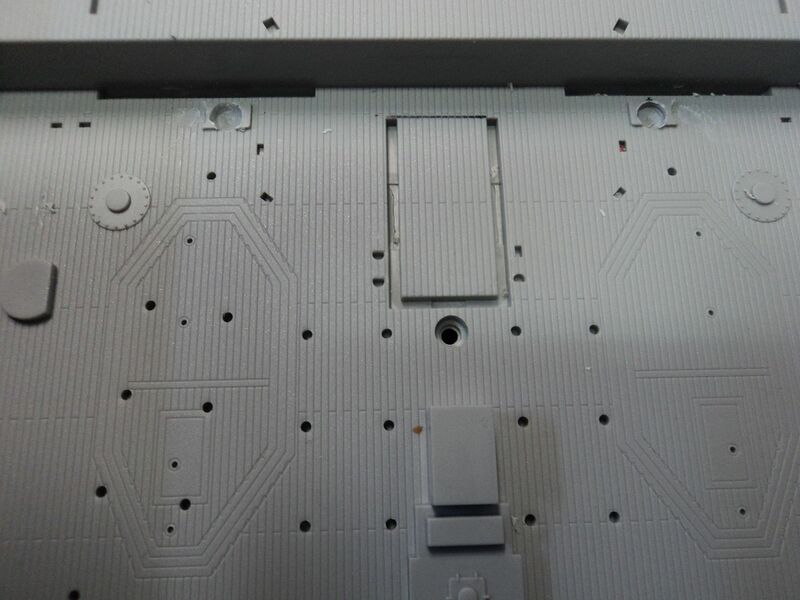 and enlarge the holes in the main top. Once accomplished, I was able to test fit. 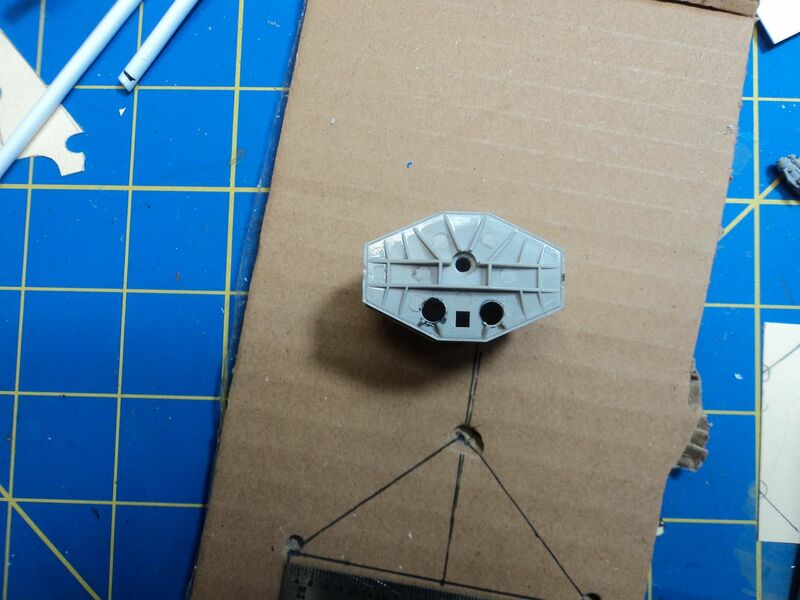 I also had to drill the areas on the deck for the legs to fit in. 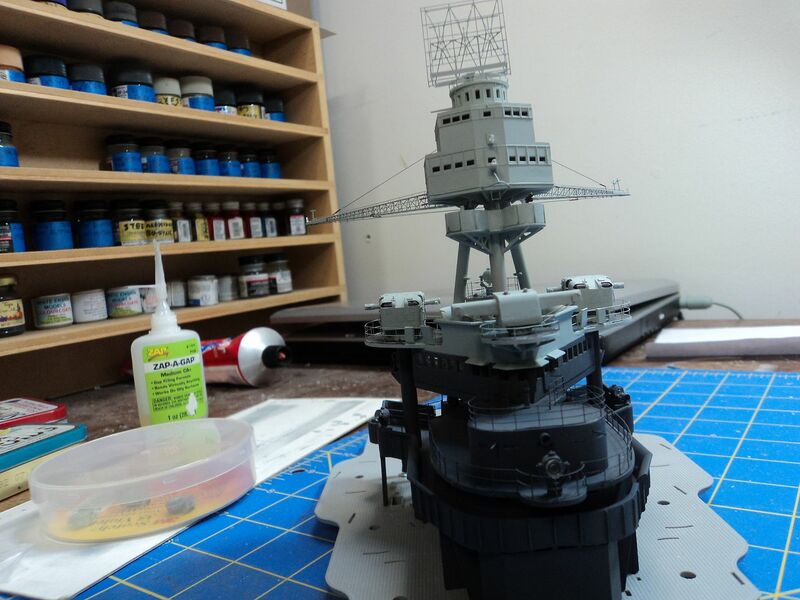 Once I was happy with the fit and location of the platforms, I began the assembly. 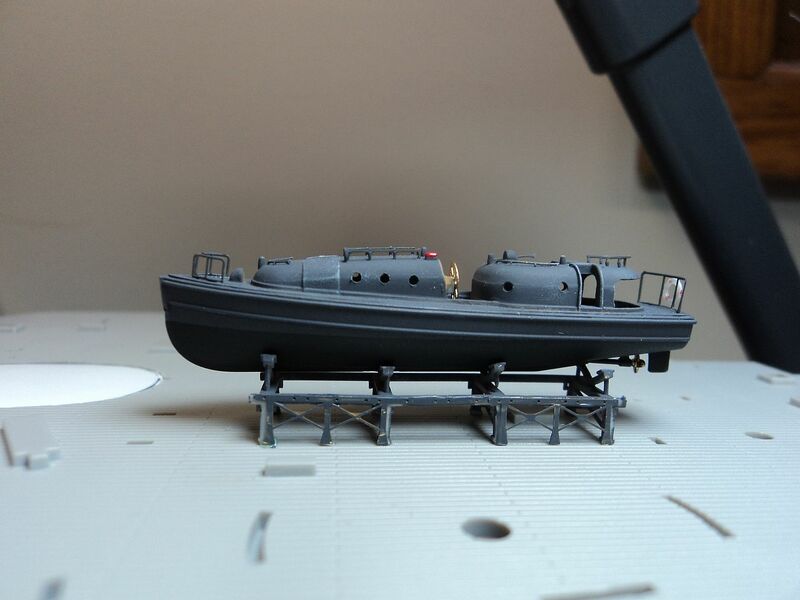 Using sheet plastic, PE from the Eduard Set and other spare bits of PE, it began to take shape. For Rigging I used "Bob's Buckles" copper eyelets and brass tubes designed for rigging WWI Biplanes and Model Kasten .06 Stretch Line. 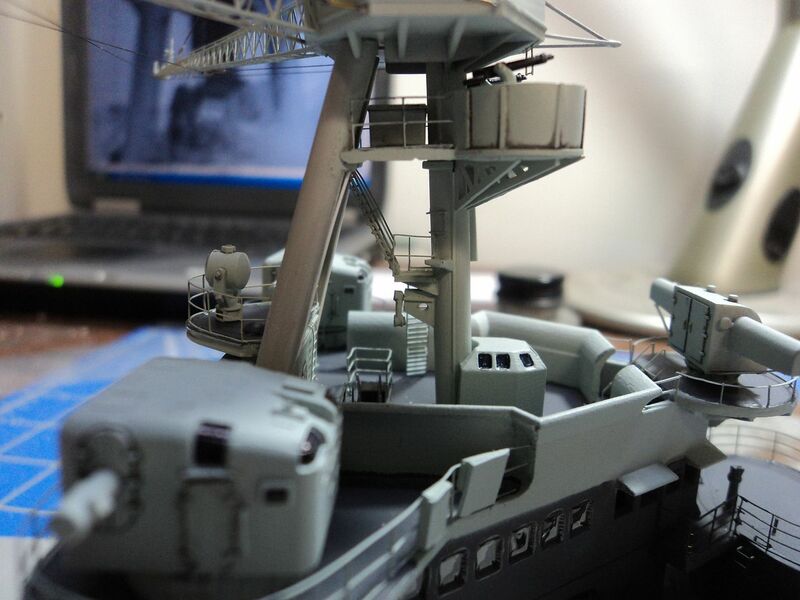 It is really difficult to get a handle of the rigging of the ship during this time frame. 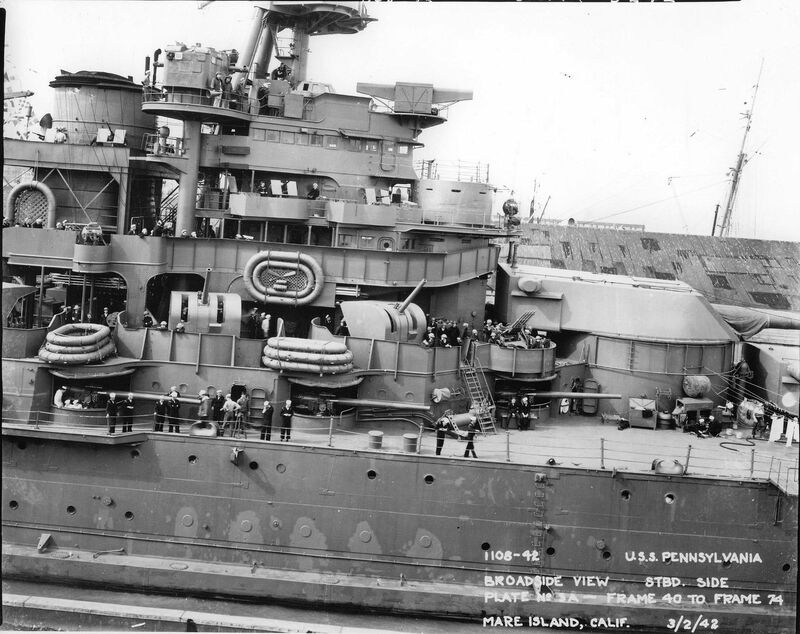 I am basing most of it on the photo's at Mare Island, as I figure the comm gear and the stays would pretty much be as it was in 1941 as not much changed aloft. The main truck is totally different than Arizona's so I scratched it out of brass rod. 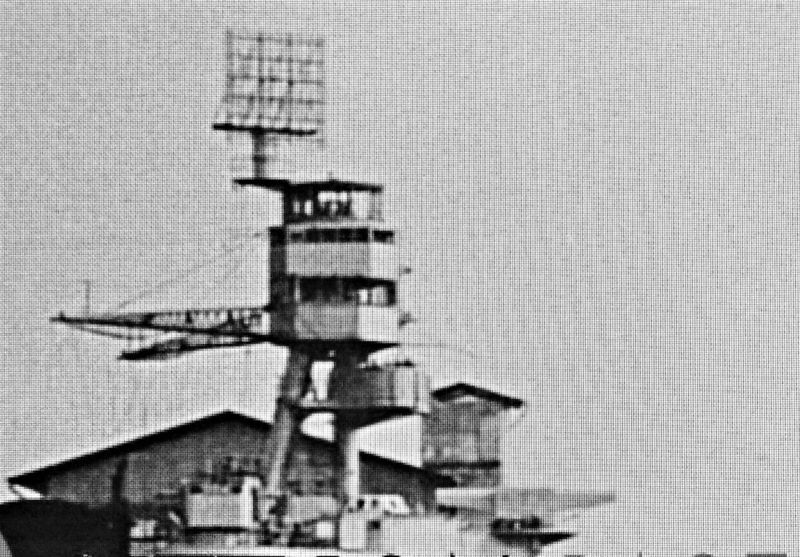 The Pennsy still had the aft range clock during this time frame and the Eduard Range clock was fixed to the main mast. I painted the face white, picked the numbers out with a sharpie and painted the arrow red. 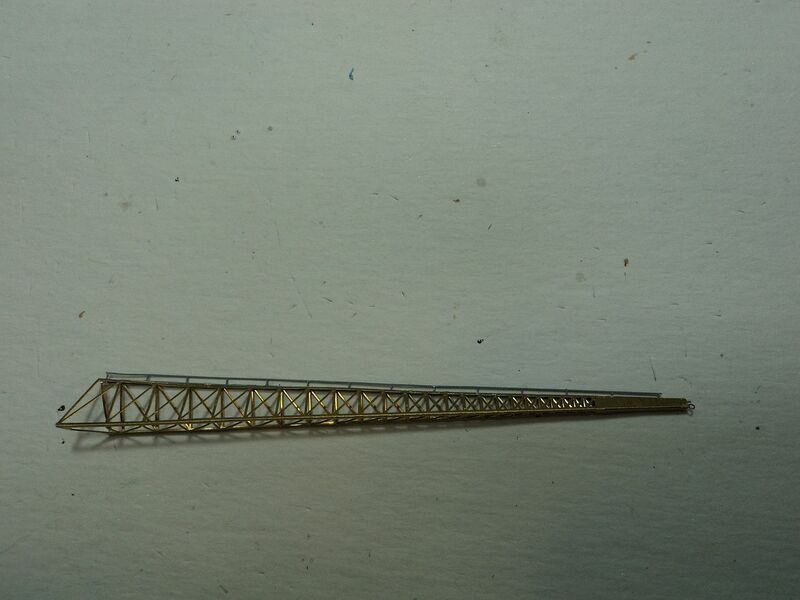 to simulate the red lights I used stretch sprue from the tail light sprue of a model car kit. This was the most challenging part of the build to date. As references are sketchy, photo's are blurry I referred to the drawing frequently. I also have a buddy in North Carolina who is doing preliminary work on a 1936 version and he assisted with some measurement issues as well. 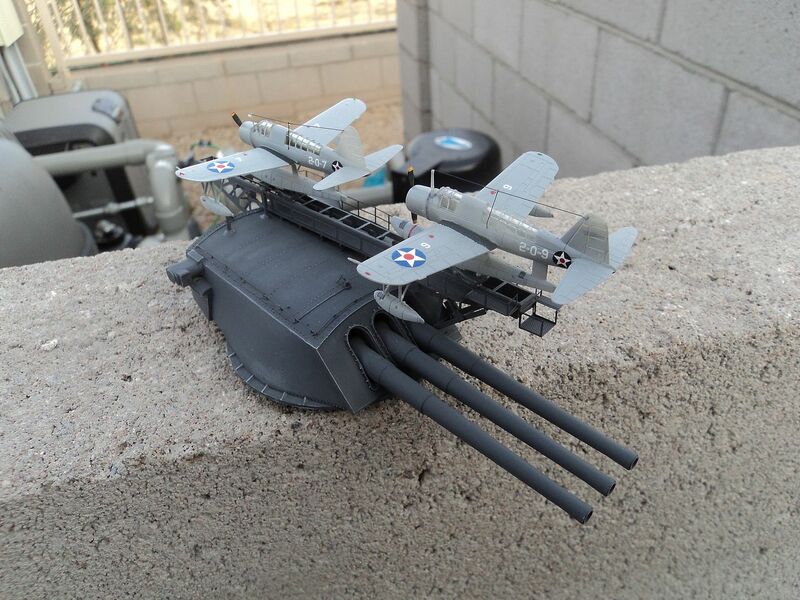 Mike, I purchased the SBD on ebay without decals or box so Ill need to pick up decals or Montex templates for a USMC a/c. I also had thought of the yellow wing version, but I think they were all painted by 1941. Bob, nice! 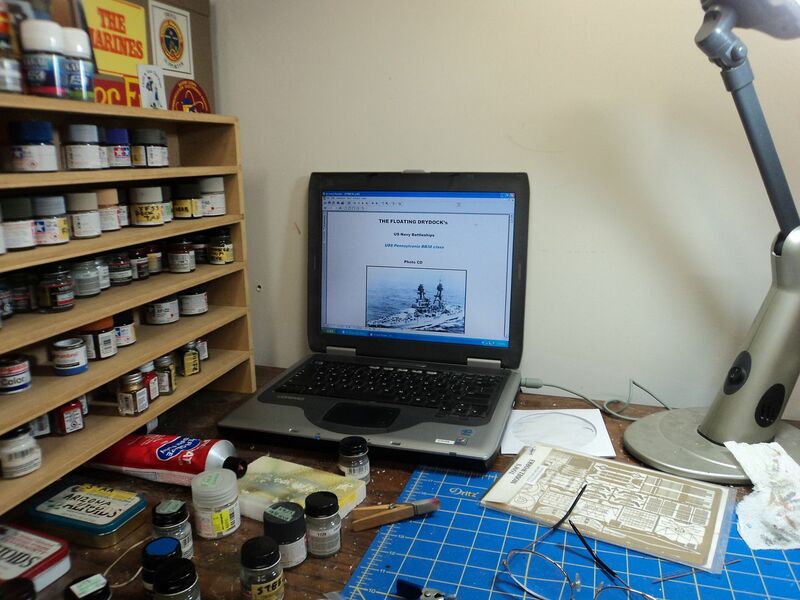 Thats how I got a couple accurate miniature kits, with and without various bits including my hangar queen sdb-1 which advertised as and came with sdb-3 box directions and decals which I didnt figure out til I started! I do believe the yellow wings were gone by late 1941. You could checkout yellow wings decals they make decals for other early USN aicraft up into 1942. Thats were I got my sbd-1 stickers at! Mark, each post you put up just takes my breath away and spend some time looking at each photo to take in the work that you've put in. Mike, I need to take a look at yellow wings to see those decals you speak of. Thanks. Thanks for your kind comments. 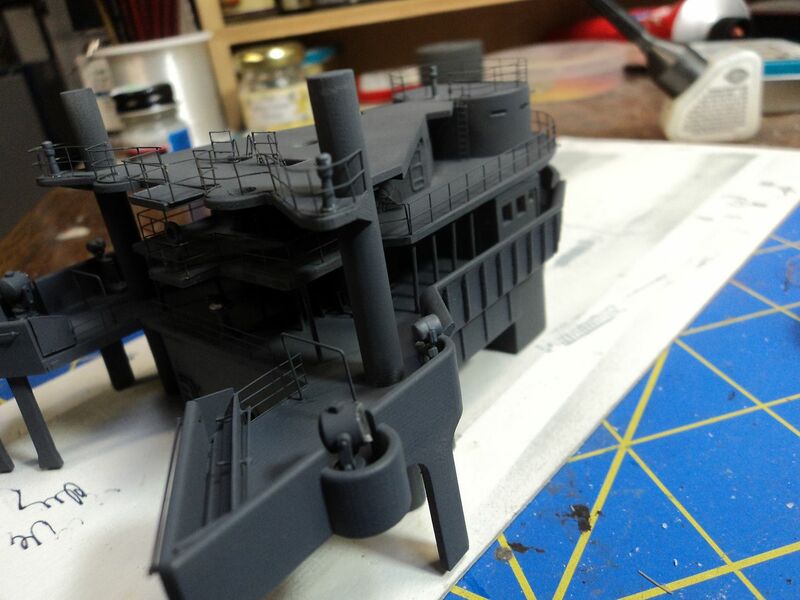 Work continues apace on the hull, but I will continue to post photo's of the progress as it occurs. By early 1941 the yellow wings were gone. The Navy went to a grey and then to the Navy two tone blue followed by the three tone. For my Pennsylvania I am doing the monochrome grey of around August 1941. 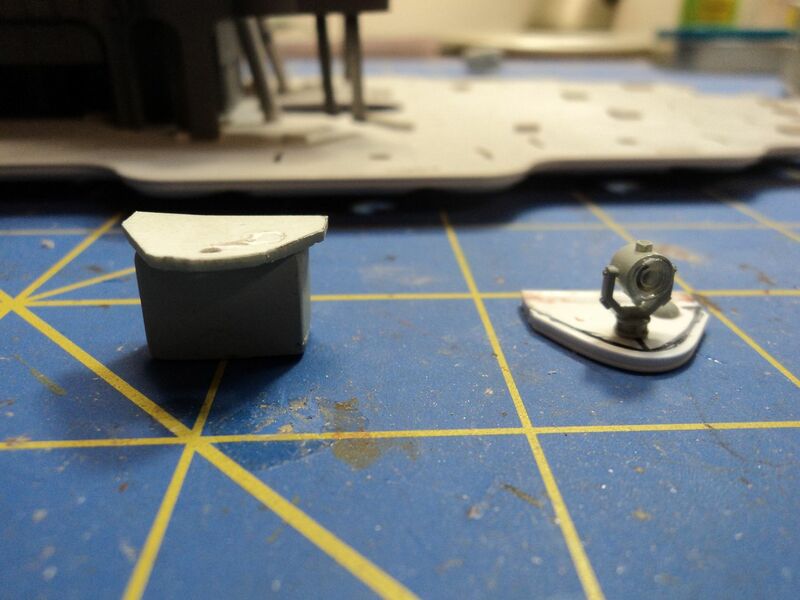 In the Photo below you can see the grey scheme of the kingfisher on the #3 turret cat. The guns are definately in 5-D. The 7 Chiefs are quite striking. My Kingfishers on #3 turret. 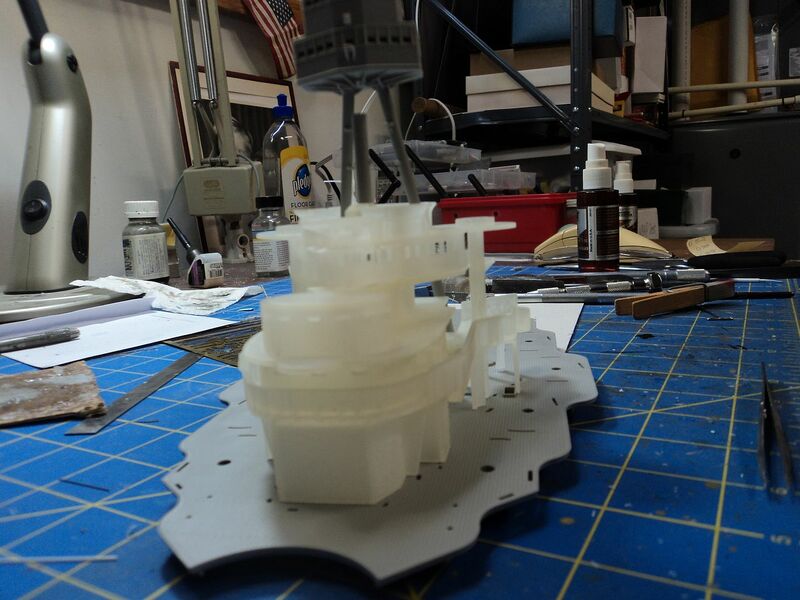 I got a little impatient and put the completed subassemblies on the hull to get an idea of how it all will look. As said some fresh pics from today. 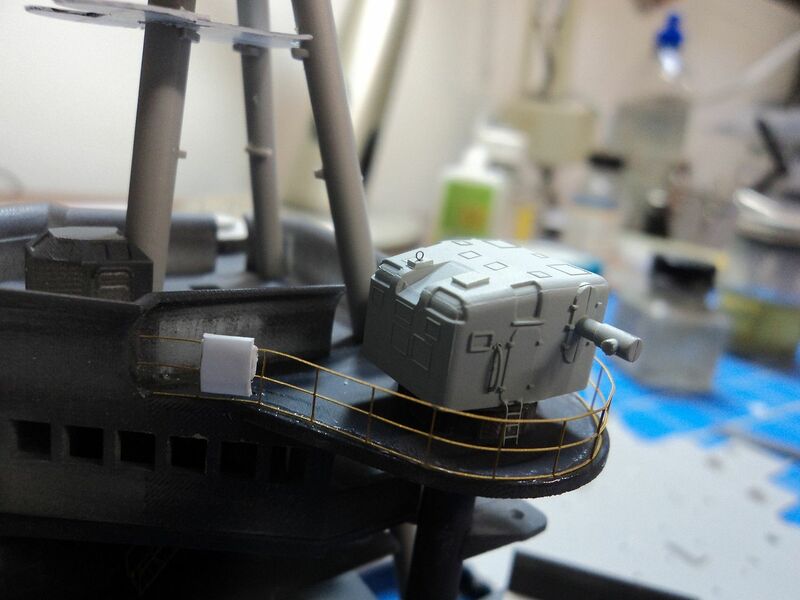 The hull is painted I started with adding the smaller details on the hull. I also started with the island, but not much was done yet. 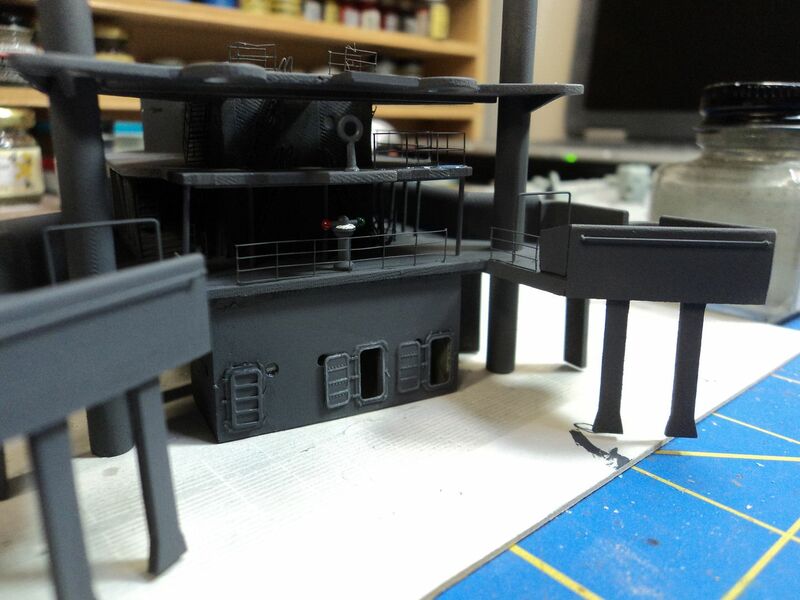 Next big step will be the flight deck. And I also started for a change with the 5 Zeros from the first wave. 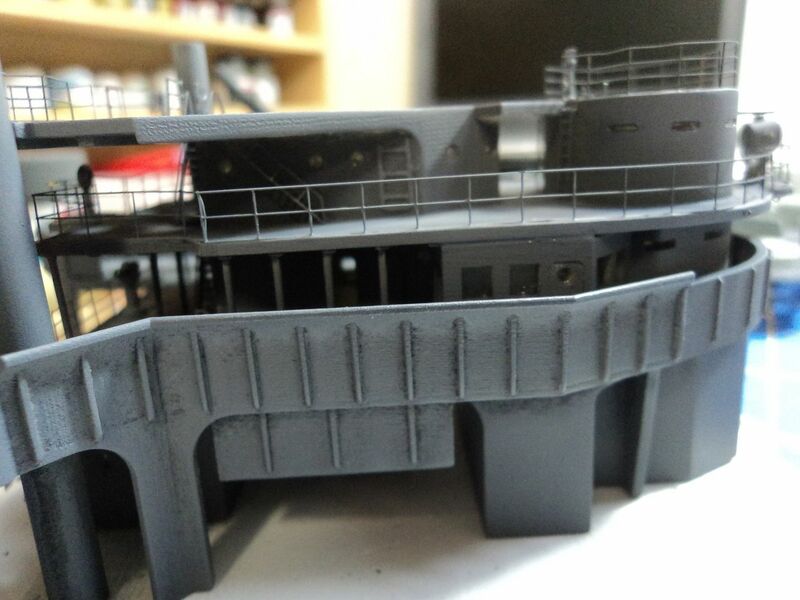 The boats are nicely detailed and will certainly add some interest to that part of the ship. 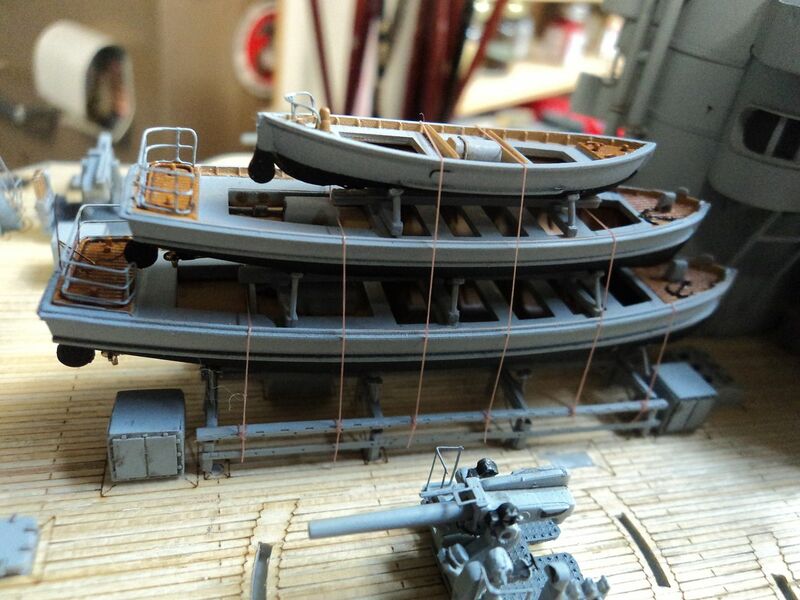 There is a lot of subtle little details in these Japanese ships. Getting the island on is also a bit of progress. Looking good. Thanks . Sadly you hardly see them later and that's why I didn't use pe on them as usually. At least the boats give a nice change from the usual grey colour. 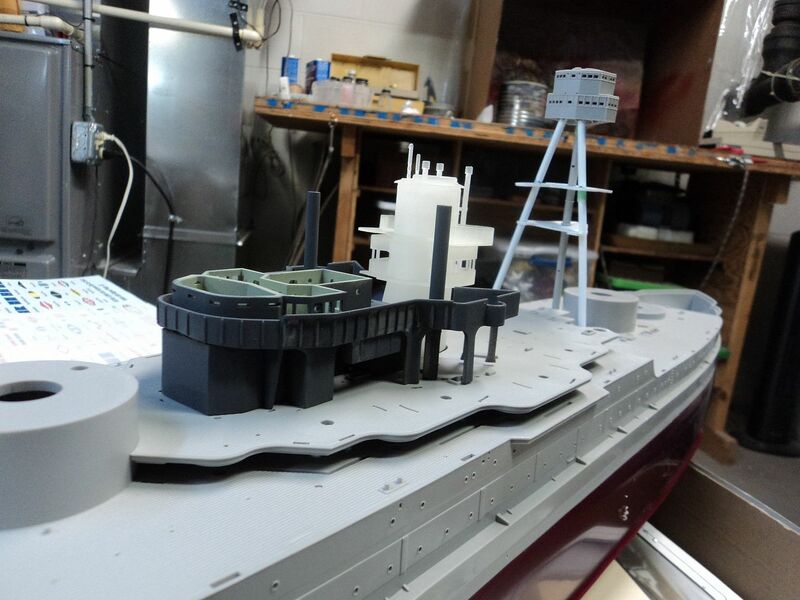 But you also made a great job, although your model is in a way bigger scale . 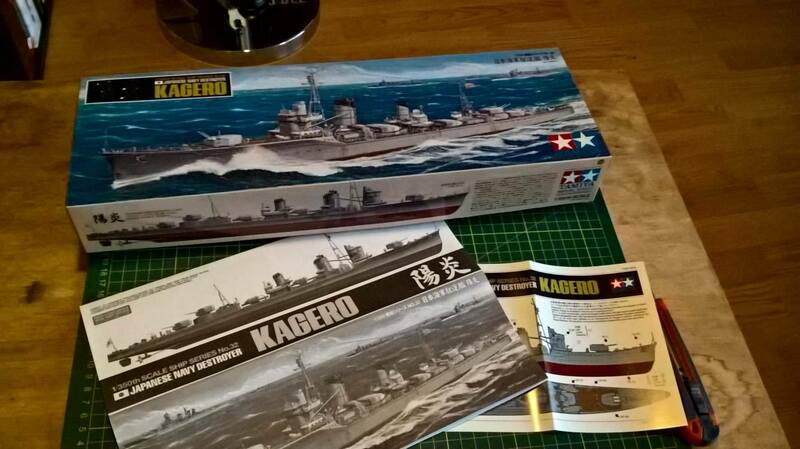 My Kagero has arrived! 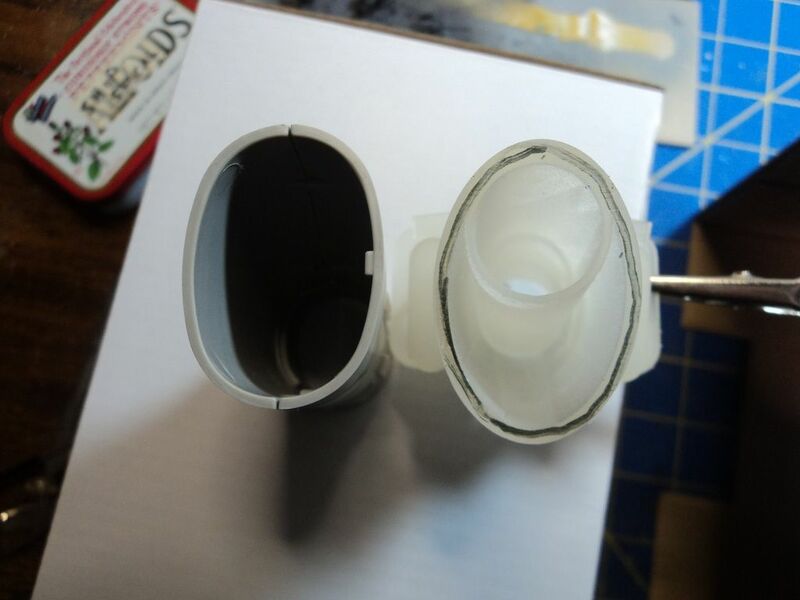 I'll create a WIP thread for most of my pics, but here's a very exciting shot of the box and instructions. Now just to wait for the photo-etch to arrive. Mark, that main mast... ! It's a model unto itself. Well done, it looks stunning. Thanks Paul for stopping by and your comments. Another area of difference is the stack. Again, Steve Larsen designed the stack for the Pennsylvania. 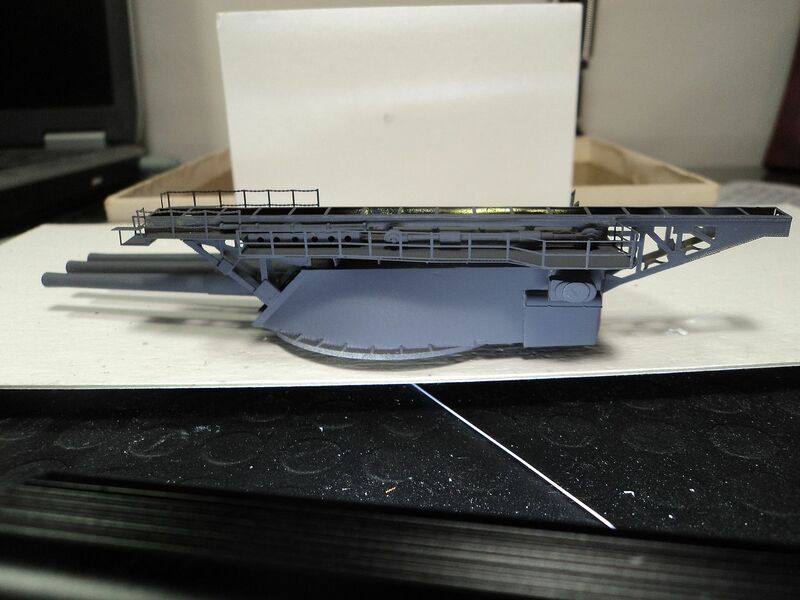 Some mods needed to be done to the boat deck as the stack was designed from the boat deck up, whereas the kit stack is designed to go through the boat deck and attach to the 02 level. and then move on to the stack itself. As you can see there is quite a difference in the shape. Using kit PE I put in the exhaust deflectors. And added bits and bobs to the stack. There isn't a lot of photo's of the stack, but this one shows some details such as the "bottle cap" helmets and what looks like storage boxes. Using chunks of plastic I added these to the stack. I think it turned out alright. One of the other things that was involved was moving the exhaust chimney for the incinerator. You can see the incinerator chimney on the stack. 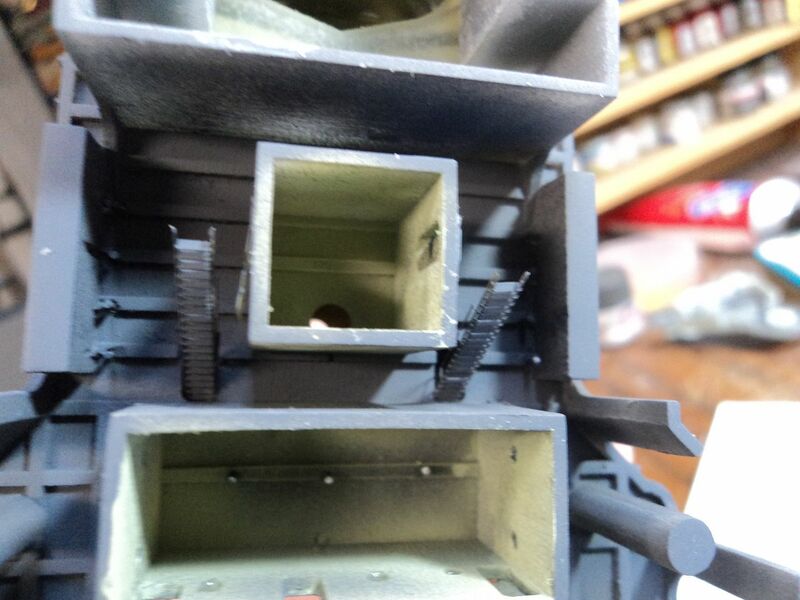 I added a handle to the door of the incinerator using the kit part. Moving on I assembled the boats. Pennsylvania had 6 of the "Captains" gigs. I had some spares from an "Extra" Arizona kit. 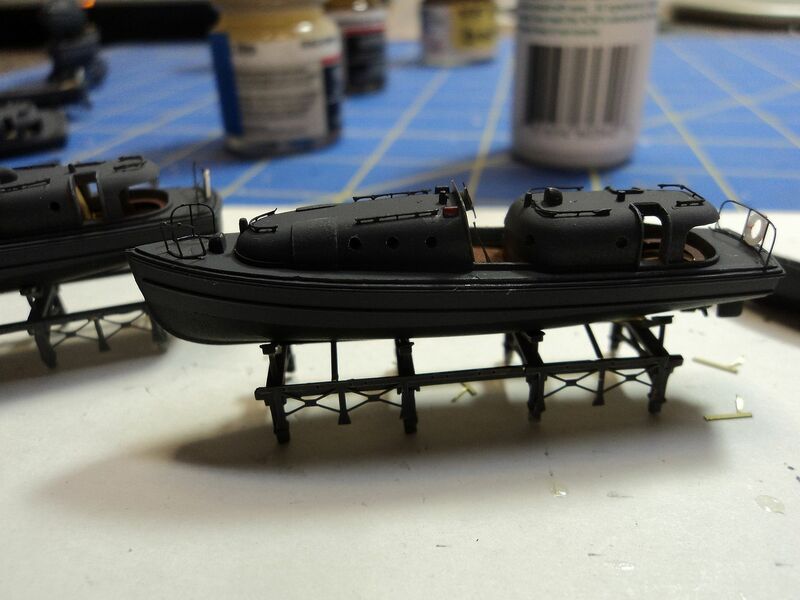 The boats were assembled per kit, drilled out the portholes and using the Eduard and the MKI set I added PE Details. Eduard provides interiors for the boats, but as it is for the Arizona kit, only 4 are provided. 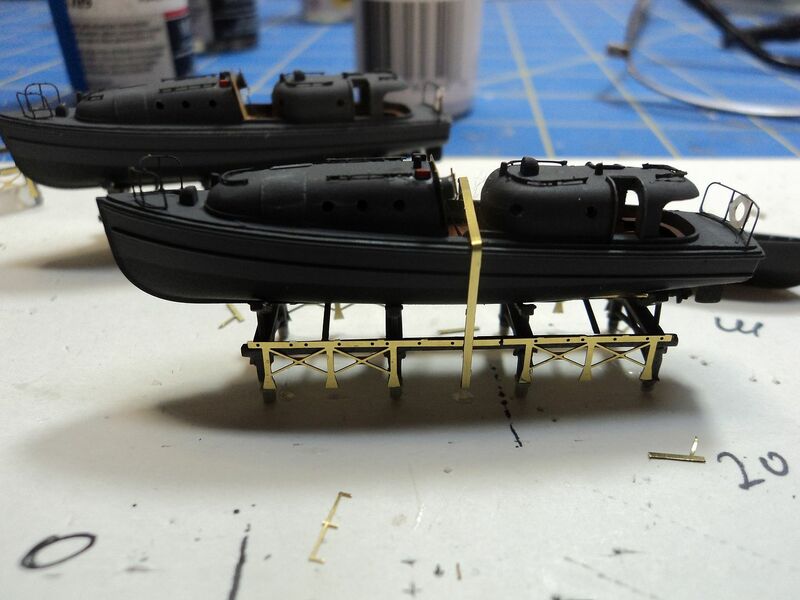 Sadly, the MKI doesn't provide interiors, so the two extra boats will be sandwiched in the middle. 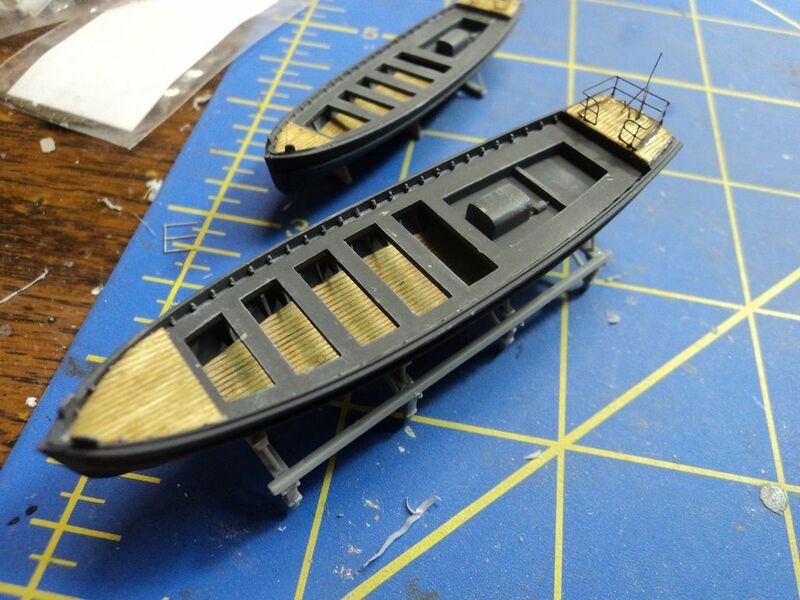 I liked the added detail of the Eduard PE set, but not the way it fit, so..........I cut out the side panels and added them to the kit plastic boat cradles. I thought it was a satisfactory compromise. And now the cradles will fit into the holes nicely without any added filling. 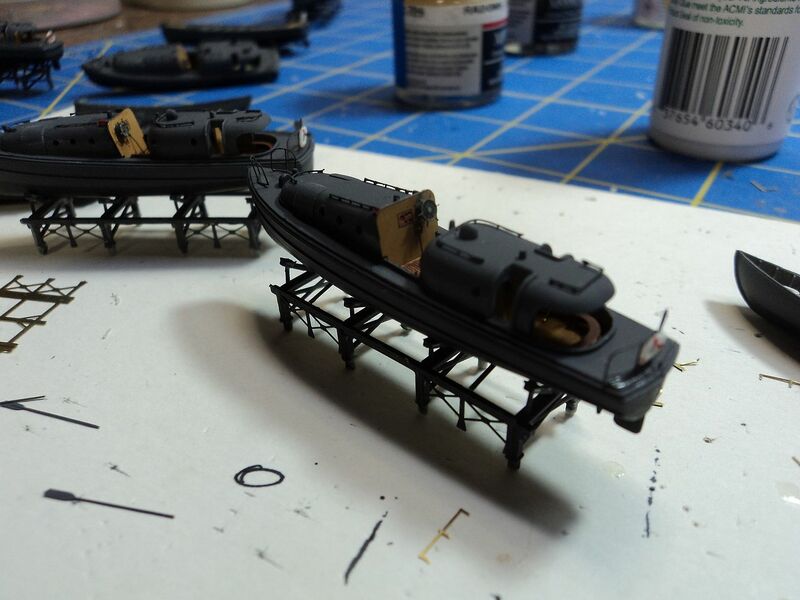 For the whale boats I used spare deck material for the bottoms of the boats. I thought it gave the boats a nice touch. As they will be cradled, not a lot will be seen, but it's enough to be noticed. 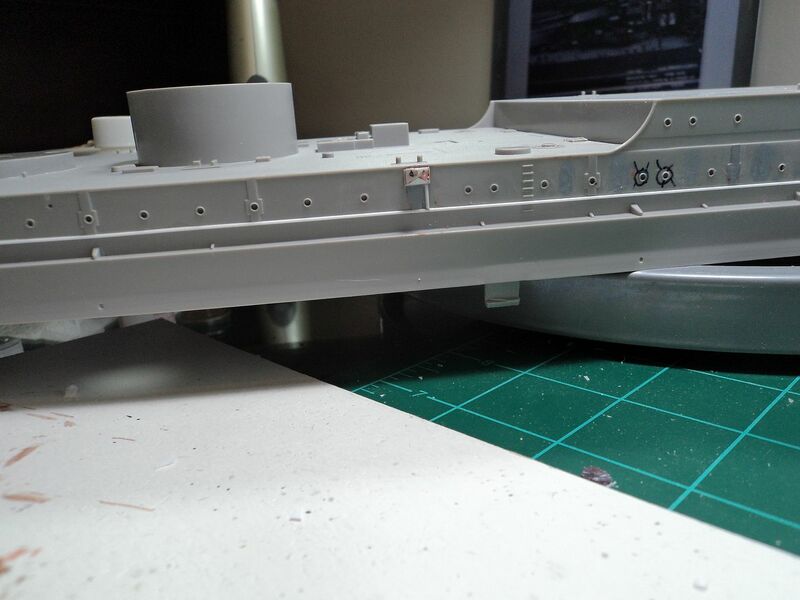 The next phase is on to the hull and that is where I am at now. I am presently travailing over the added armor belt and the unique "notch" as it ends aft. So far......ahhh. The anchor hawses are molded upside down, so had to be cut off. It looks rough now, but once blended, painted and with the anchors in place, it looks pretty good. 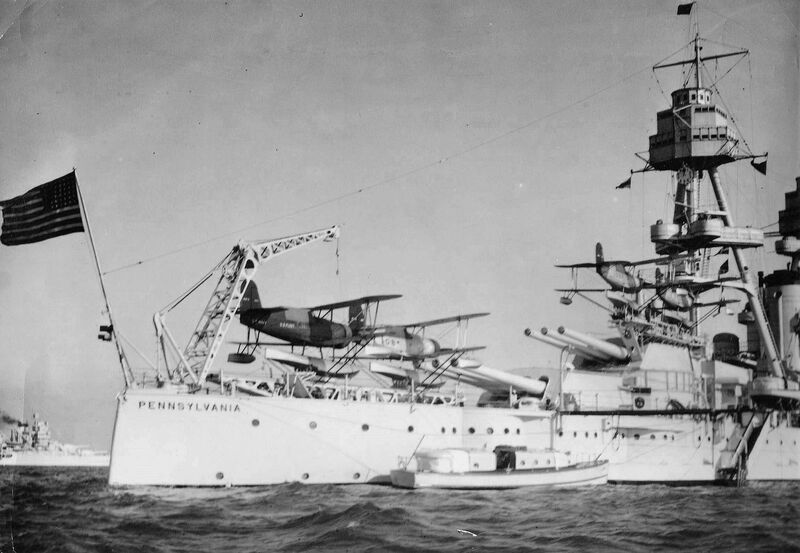 The aviation fuel line and stations on Pennsylvania were on the starboard side and had two stations vice on the port and one station like Arizona. 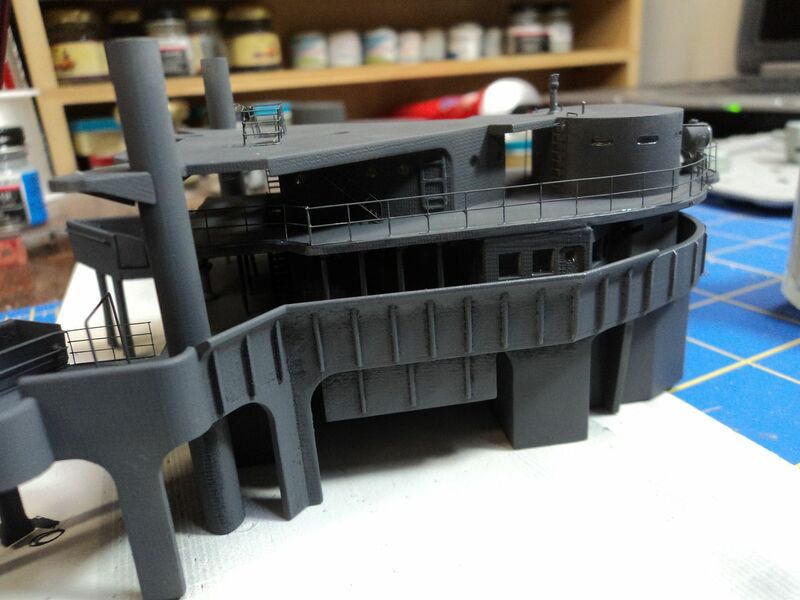 I also added and removed portholes. 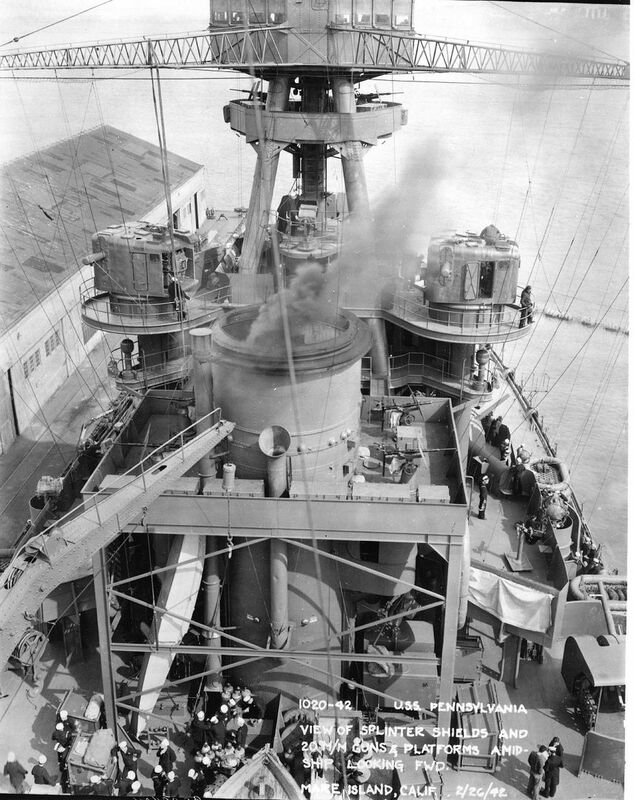 In the image below you can barely see the aft station just above the bow of the gig. So that is where I am at now. 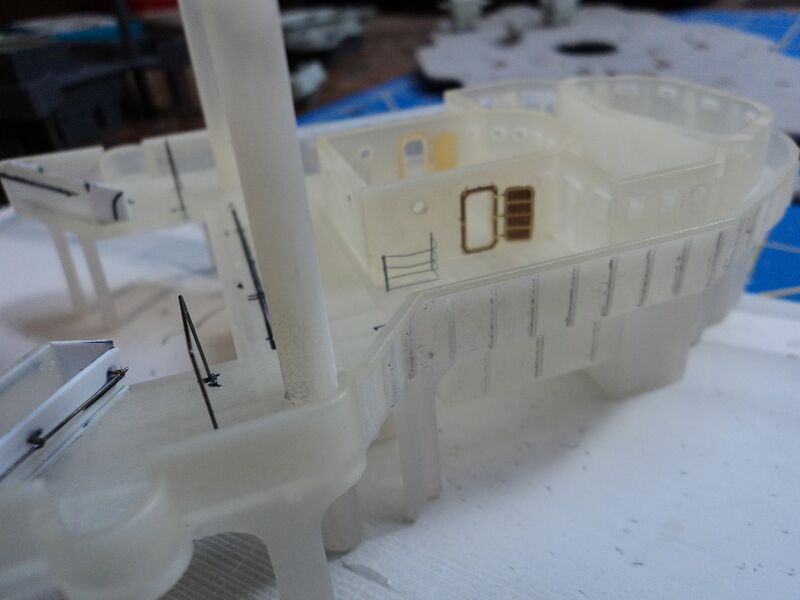 Once I get the hull painted I will post more photo's as it looks pretty rough right now. Thanks for looking in and your comments. Moving on the cranes, yes even the aircraft handling crane is slightly different on Pennsylvania than on Arizona. 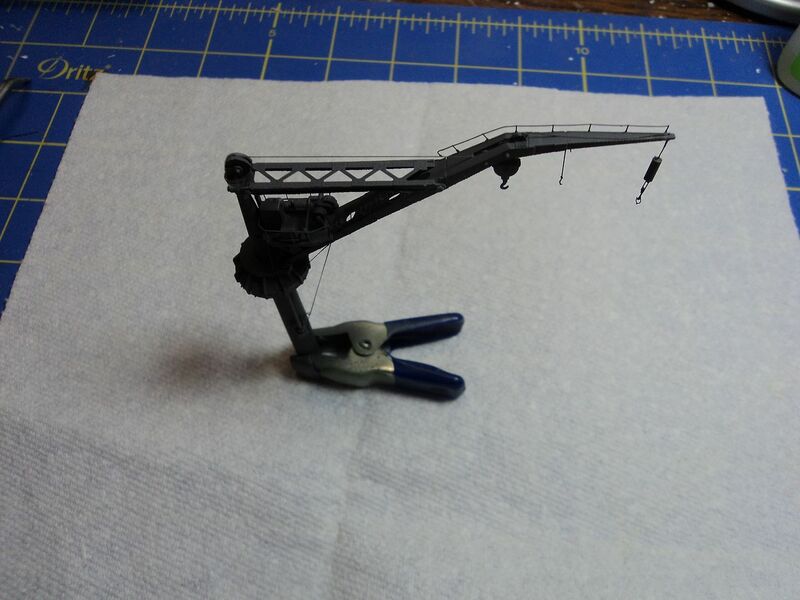 Using the PE from the MKI set and remnants from the kit part, I assembled the crane. 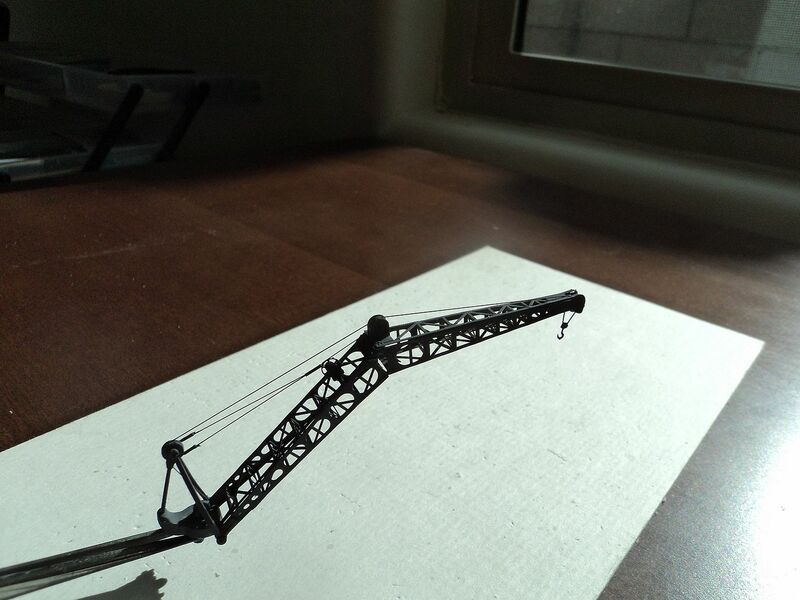 The photo below shows to good effect the Pennsylvania crane, it had a third wheel as seen here. 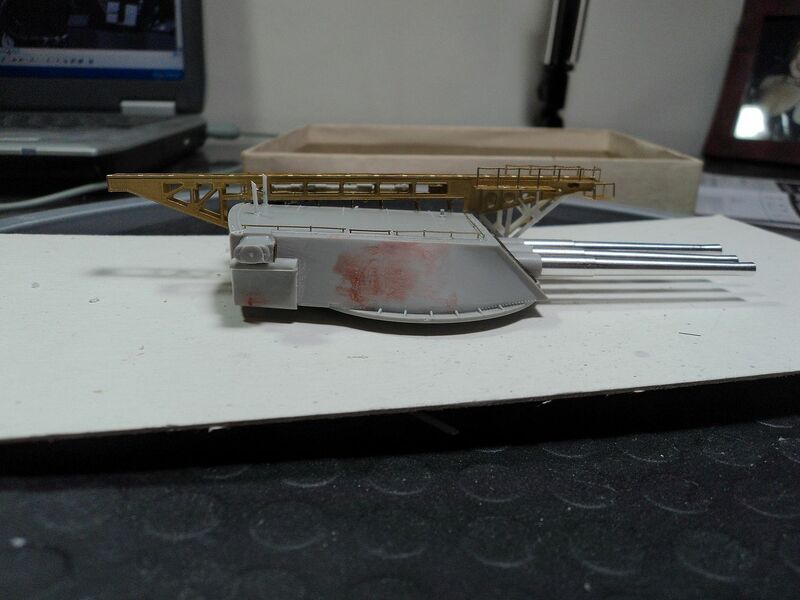 So finding a spare wheel on the PE sheets, I added the wheel to the crane. 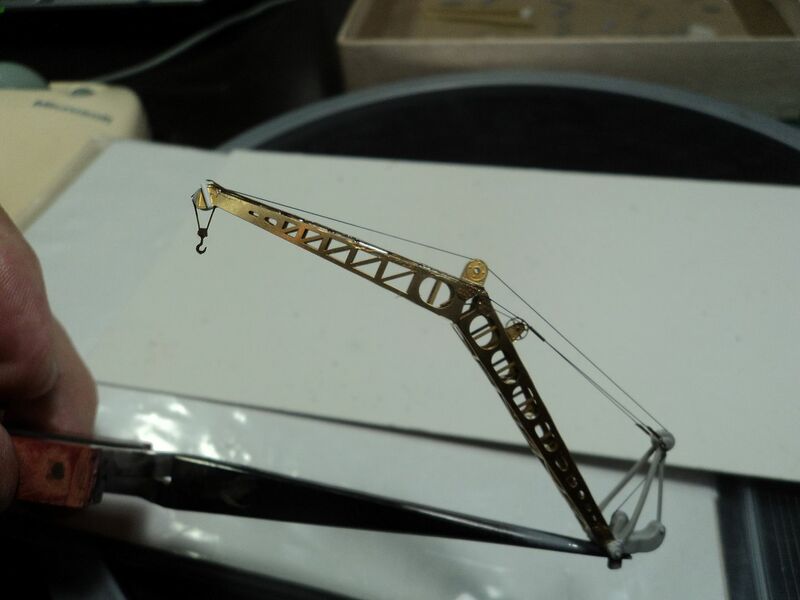 What is nice about the MKI set, it provides the internal bracing for the crane, whereas Eduard, WEM do not. For rigging I used the Modelkasten line and Bob's Buckles tubes. 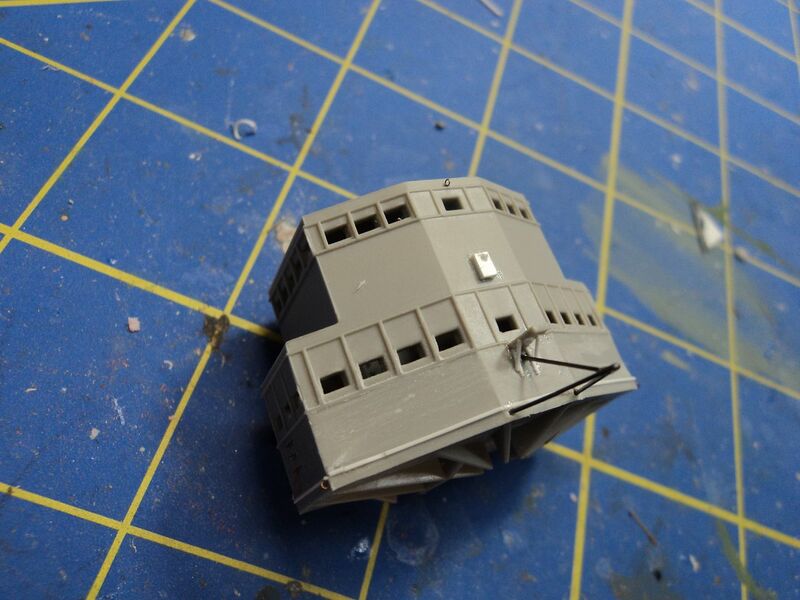 Yet another difference I unearthed was the catapult on number 3 turret. 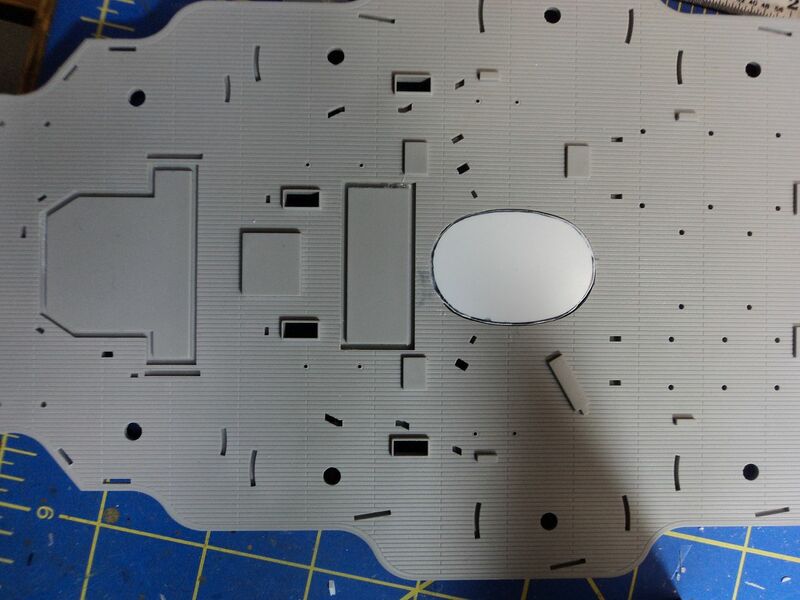 In this image you can see a lot of structure on the glacis plate of the turret. 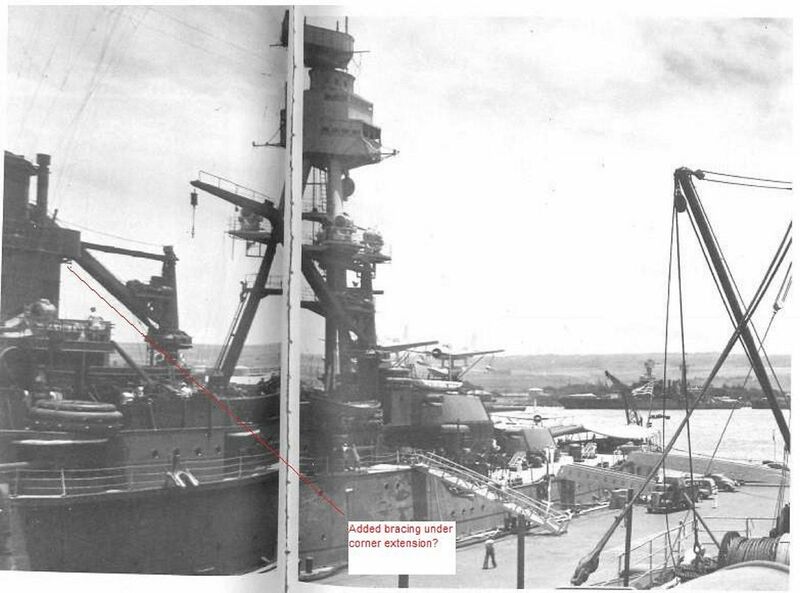 And in this one from the 30's a better view from the aft end also showing the work wasn't done at Mare Island. 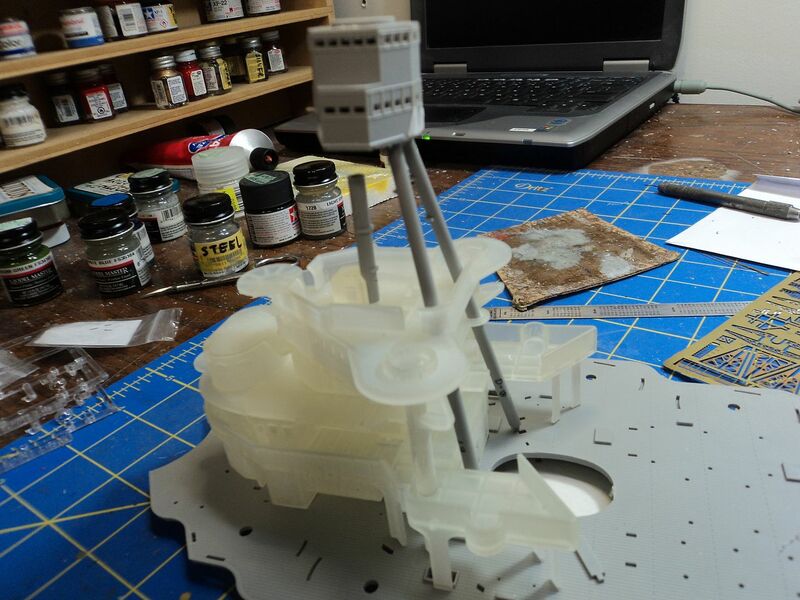 So using the MKI Catapult I added the struture using bits of plastic strip. 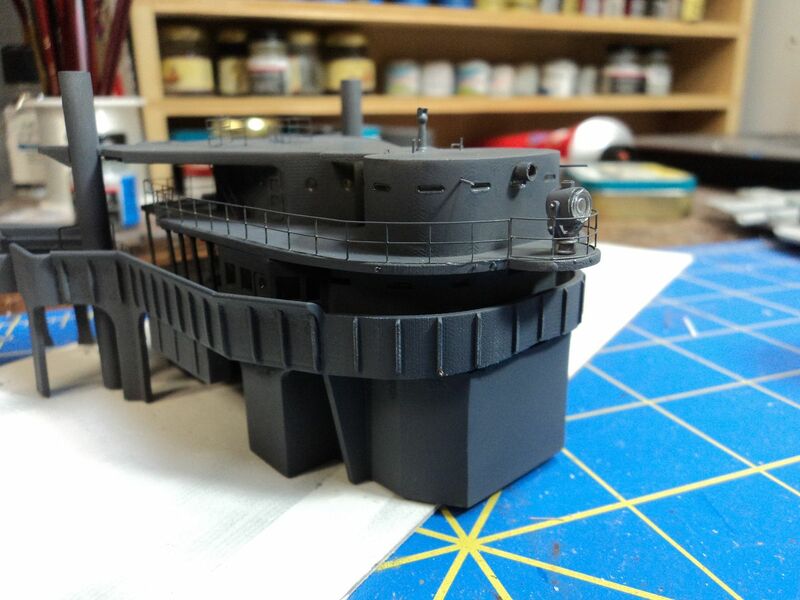 Much debate has ensued regarding the color of the top of the #3 turret both on Arizona and Pennsylvania, I opted for the overall dark grey/non skid option. Stay tuned for more modeling excitement.